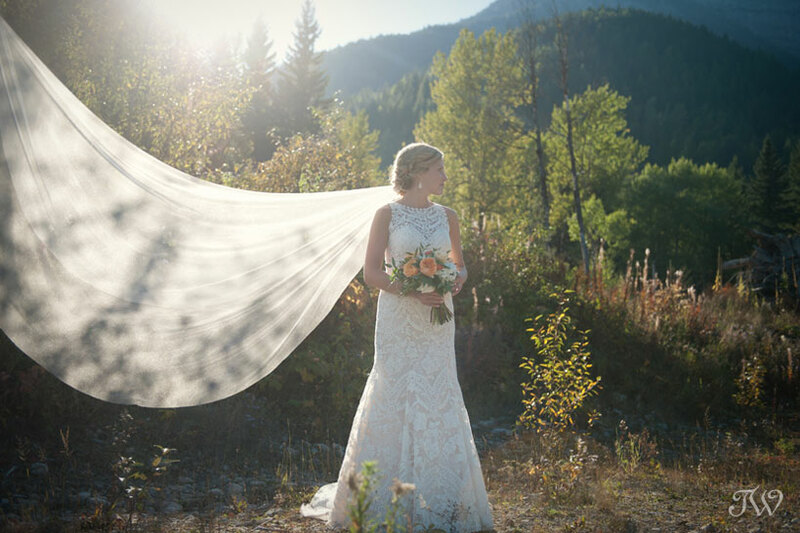 Not long ago, I spent a cozy, winter morning chatting with Britney Wilson and Lisa Gonzalez from Great Events to learn what makes a Bow Valley Ranche wedding so special. 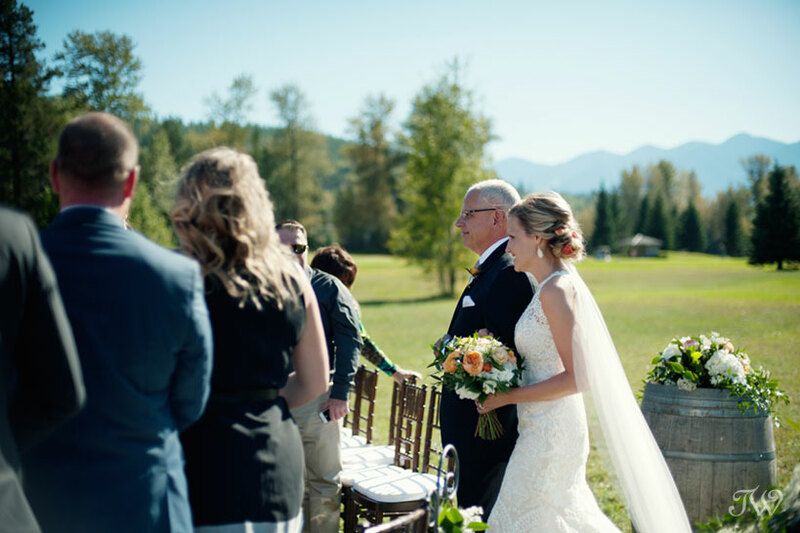 Lisa, who is the event coordinator at Bow Valley Ranche (BVR), has a true passion for this slice of Calgary history, nestled in the heart of Fish Creek Park. 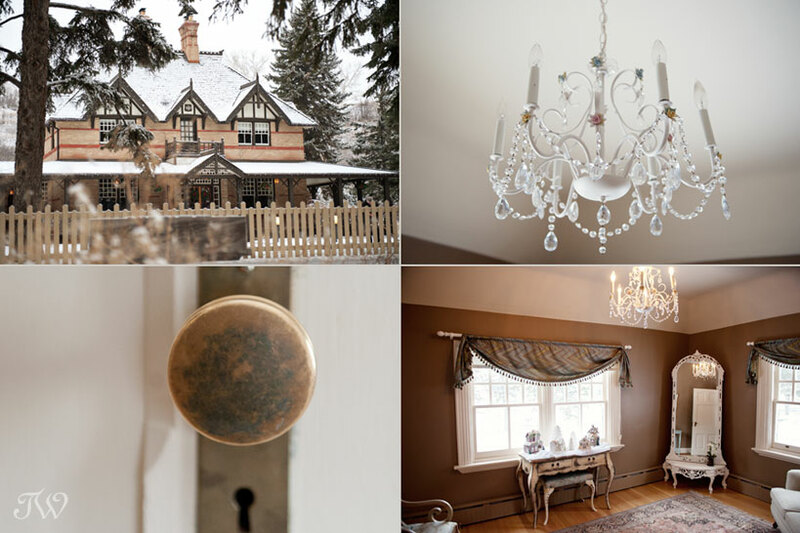 If you’re looking for a Calgary wedding venue (with a past 😉 ), this is the post for you. Tell us about the background of Bow Valley Ranche and what makes it a unique part of Calgary culture. 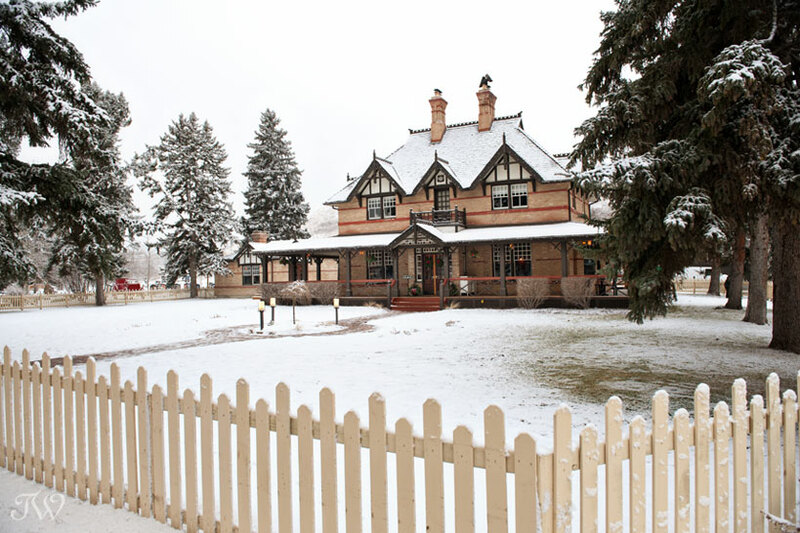 1896 The house was built for William Roper Hull, a rancher originally from England, in 1896. 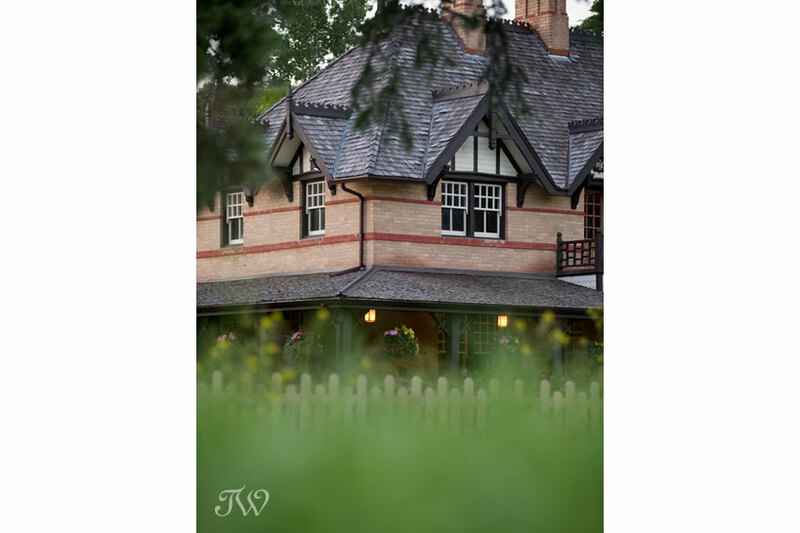 “The house was an excellent example of the Queen-Anne style in a rural setting. 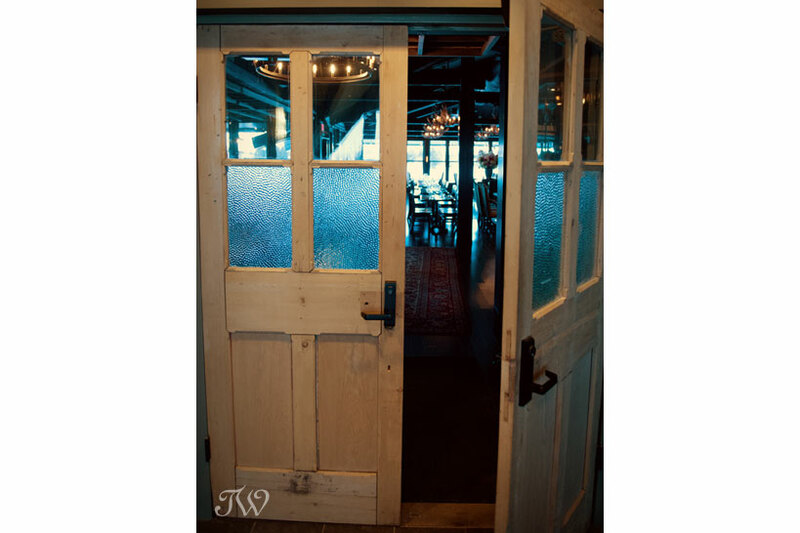 Its doorway was flanked by whale ribs, string quartets played on the lawn during extravagant garden parties, and upper-crust English gentlemen were frequent visitors”. 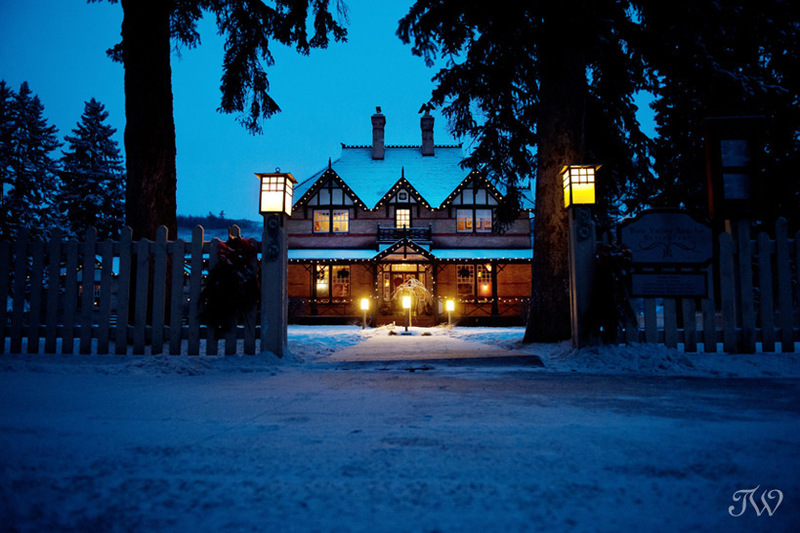 1902 The property was sold to Senator Patrick Burns who first dubbed the property, Bow Valley Ranch. Burns was a member of the “Big Four”, a group of local businessmen who founded the world-famous Calgary Stampede. 1973 The property was acquired by the Government of Alberta and became a part of Fish Creek Provincial Park. 1995 The Ranche at Fish Creek Restoration Society was formed by local residents Larry and Mitzie Wasyliw, to restore BVR. 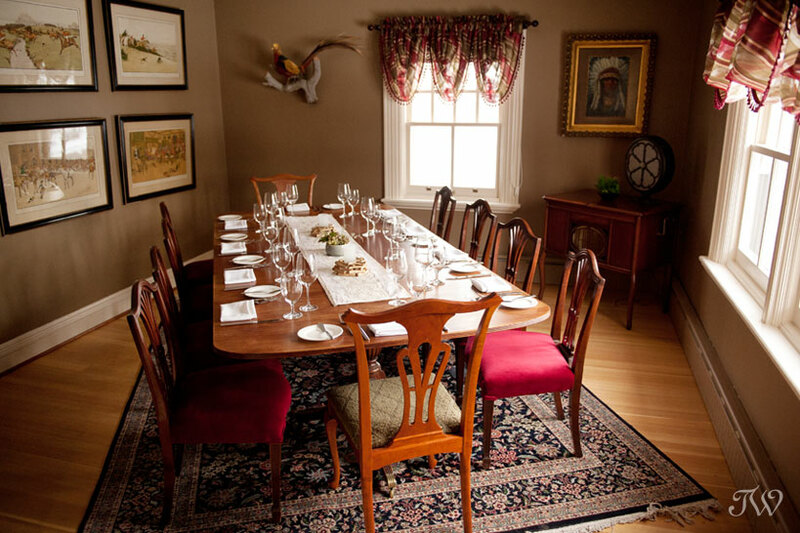 1999 Restorations were complete and the house opened to the public as a restaurant in 1999. 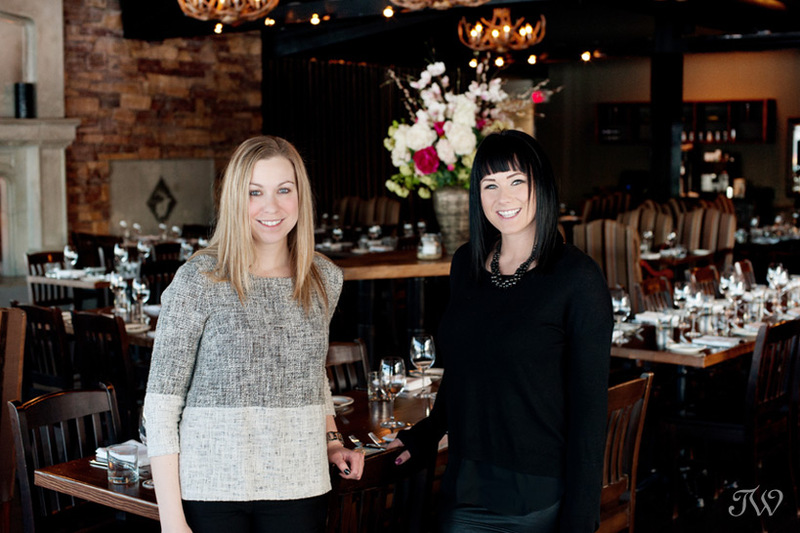 2014 Great Events officially opened its doors as the new Bow Valley Ranche Restaurant. Thanks to Lisa who is a BVR aficionado. 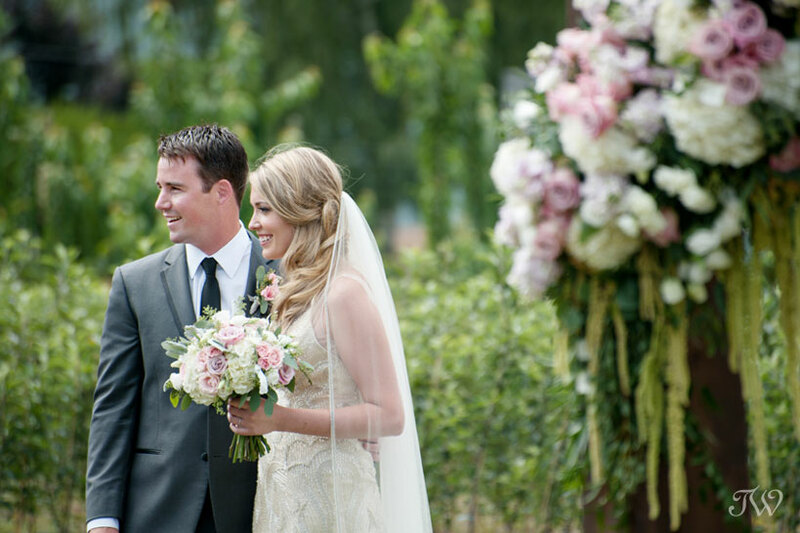 Who are your ideal bride and groom? 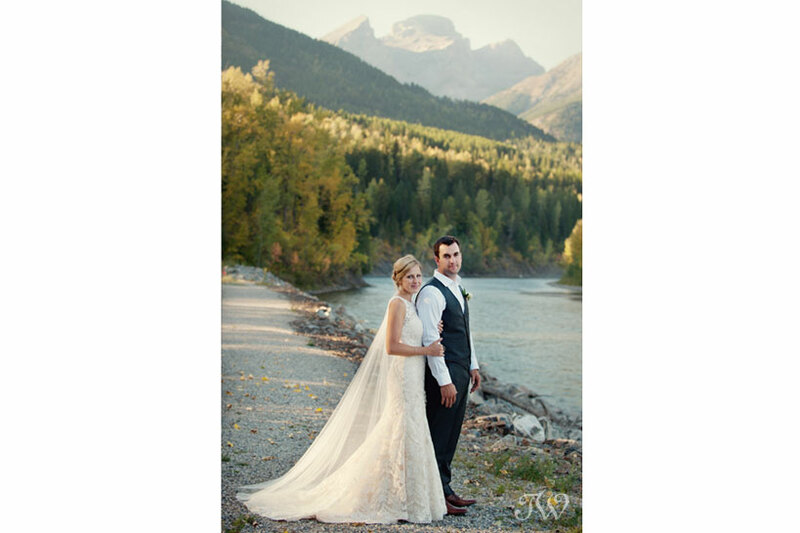 Couples who choose a Bow Valley Ranche wedding typically appreciate the classic, rustic elegance of the property. 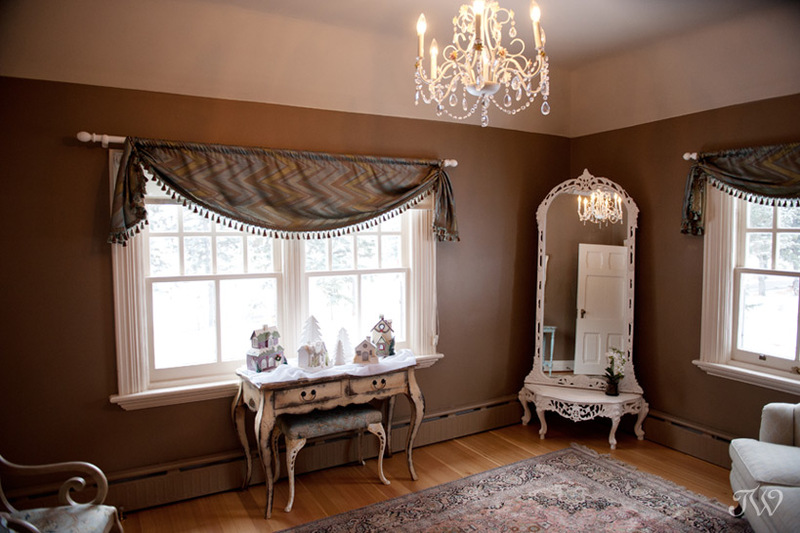 It doesn’t require much embellishment as the house is filled with antiques and décor in the style of the home. Did I mention Lucky? He’s attended many a wedding and you’ll find him above the stone fireplace in the Grand Salon. 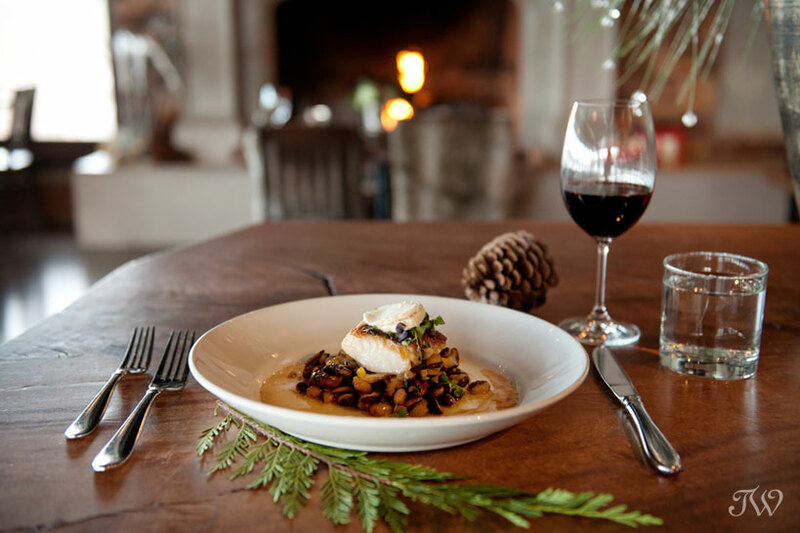 Their couples are usually looking for a fine dining experience and Executive Chef Jenny Kang provides just that. 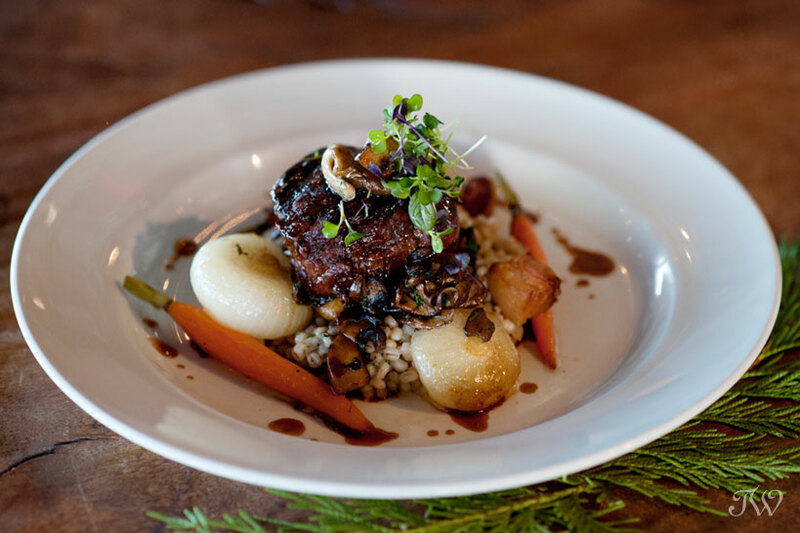 The menu includes ingredients that are in-season and locally-gown, including organic, sustainable meat, game, fish, poultry, vegetables and grains. During the summer, they even cultivate their own herb garden in the backyard. Charlie’s lounge, named for Charles Yuen, the handyman-turned-cook who worked for both William Roper Hull and Senator Patrick Burns. What are some features that set it apart? BVR is located on the edge of a meadow in Fish Creek Park, a favorite spot for locals. Although it’s surrounded by Calgary on all sides, it feels like an escape from the city. Plus it’s the perfect location for wedding photos. 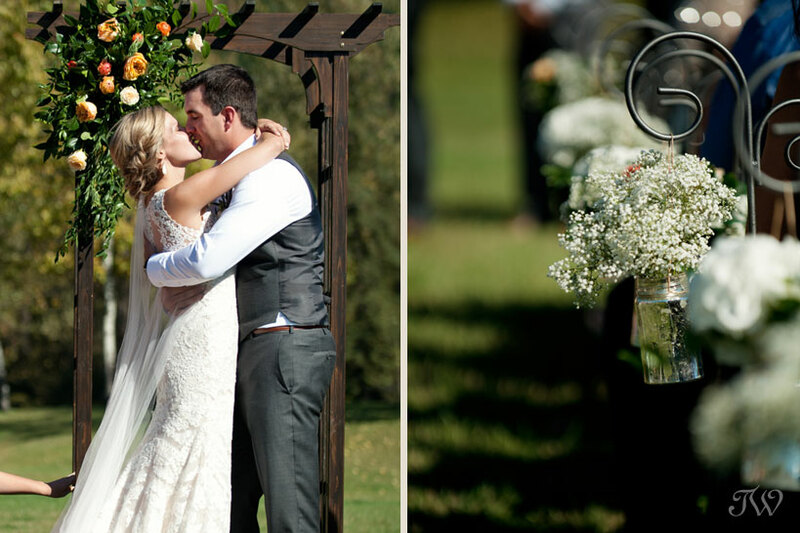 At BVR, a couple can have their ceremony, cocktail hour and reception all in one place, making it most convenient for wedding guests. 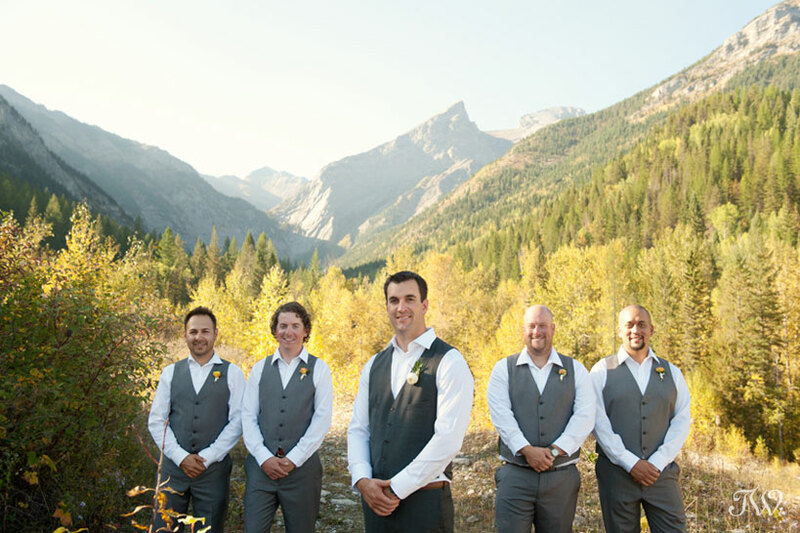 The Tsuu T’ina Bride’s Room and John Glenn’s Wolf Den are available for the bridal parties and their final preparations. 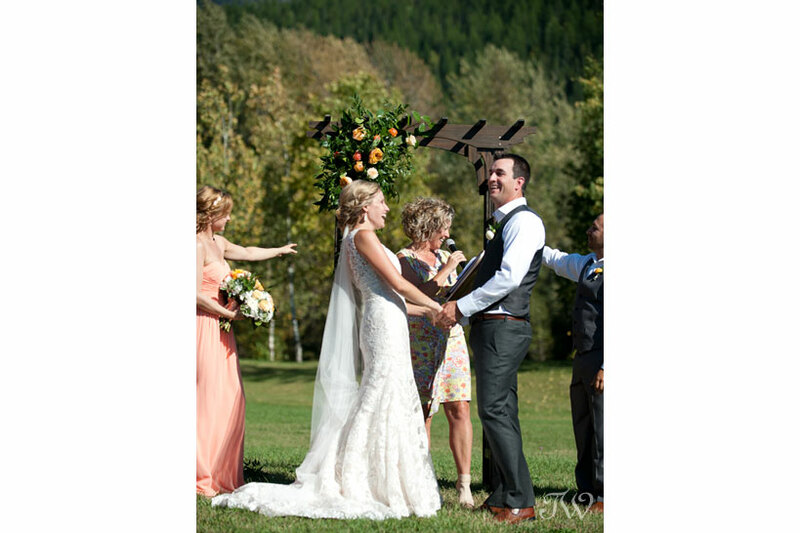 Weather permitting, Bow Valley Ranche wedding ceremonies can take place on the grounds or indoors. 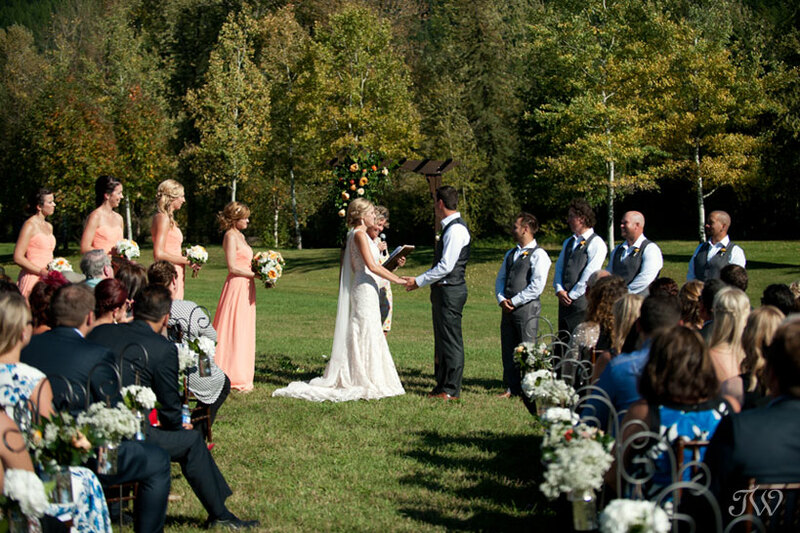 BVR hosts one wedding per day and the fenced area surrounding the house is reserved for you and your guests only. 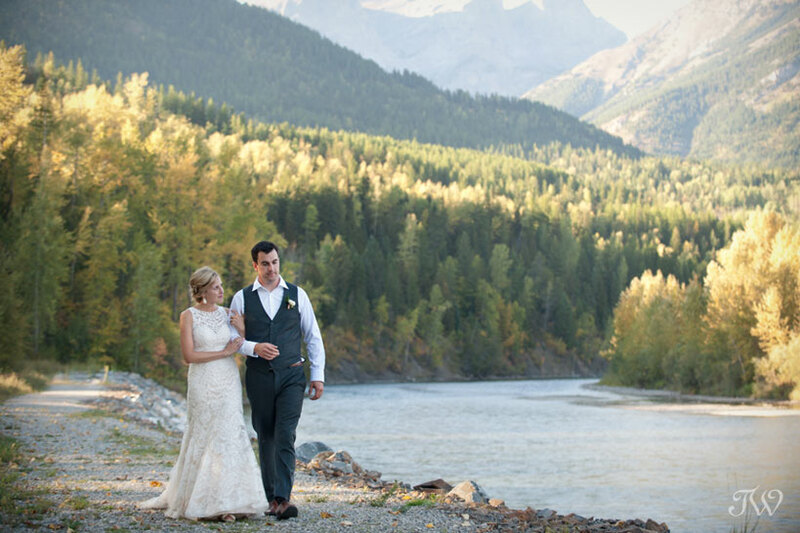 Couples planning their Bow Valley Ranche wedding may select two meat entrees and a vegetarian option. Lisa tells me that the beef tenderloin is a wedding favourite. After dinner, couples can delight their guests to a dessert buffet including treats like mini-maple crème brûlée and mocha mousse cups. Yum! 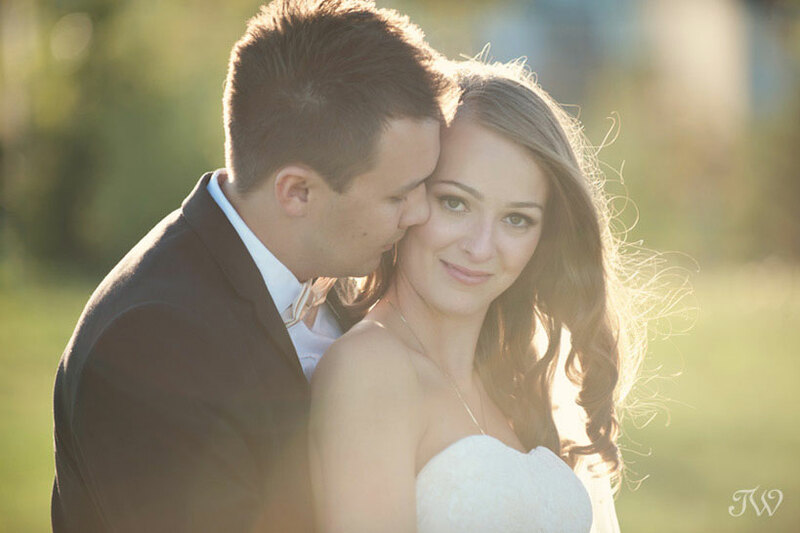 Is there availability for 2016 couples? 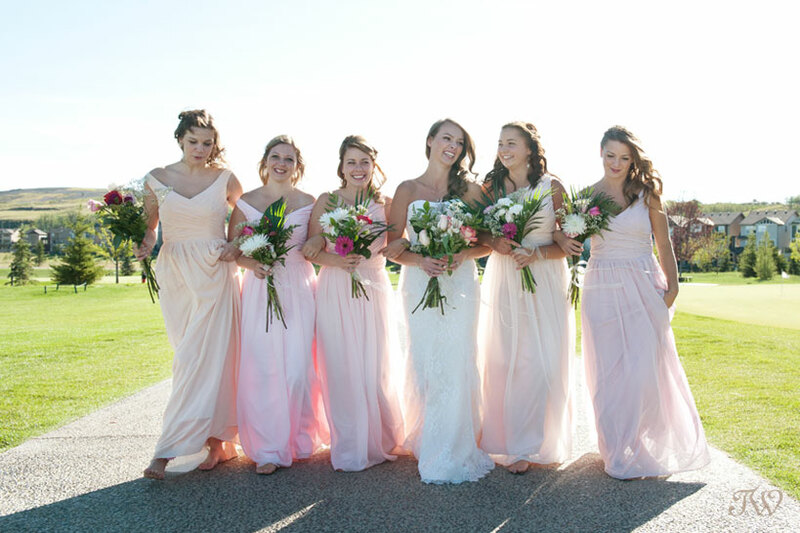 At present, there are a few wedding Saturdays available in June 2016. 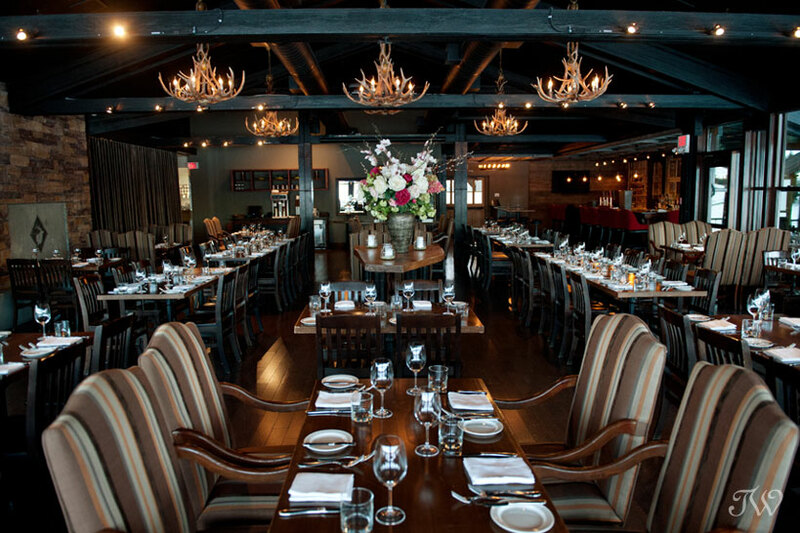 Be sure to contact Lisa at events@bvrrestaurant.com to ask about Friday and Sunday availability too. 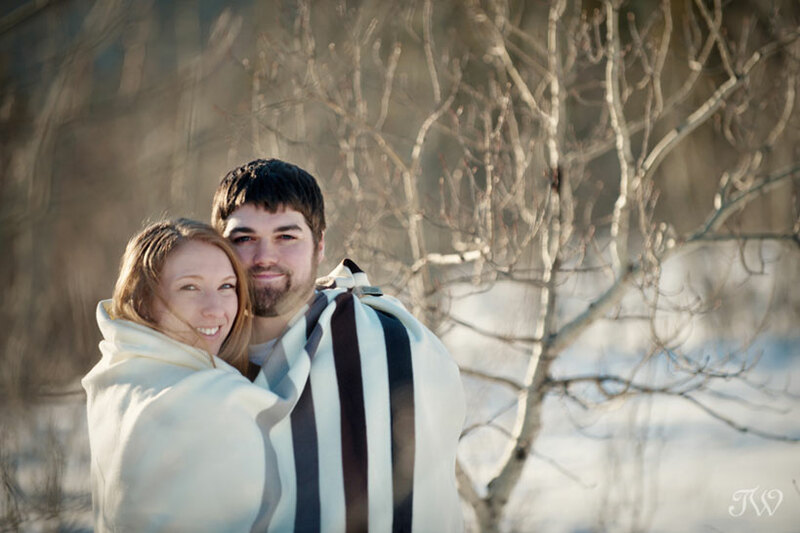 Bow Valley Ranche is currently running a winter promotion…no facility rental on any bookings. Lisa will fill you in on the particulars. A big thank you to Britney and Lisa for the coffee and the tour. 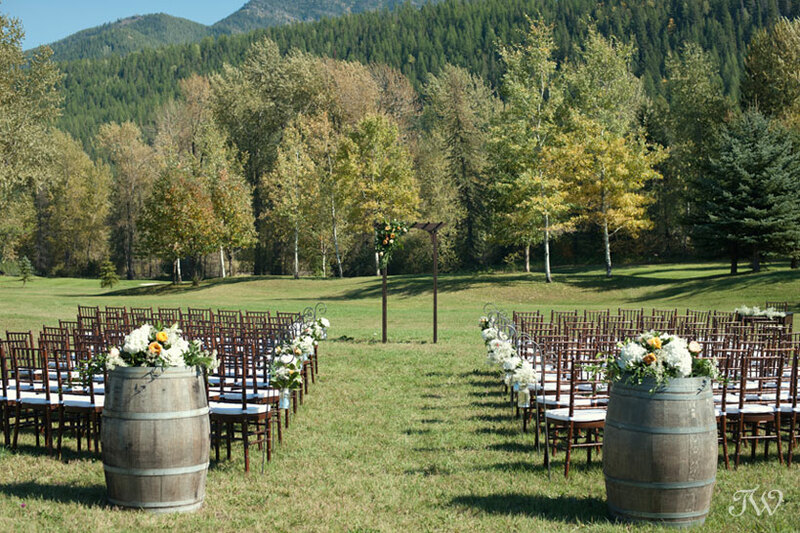 I’m looking forward to a Bow Valley Ranche wedding or two this year. 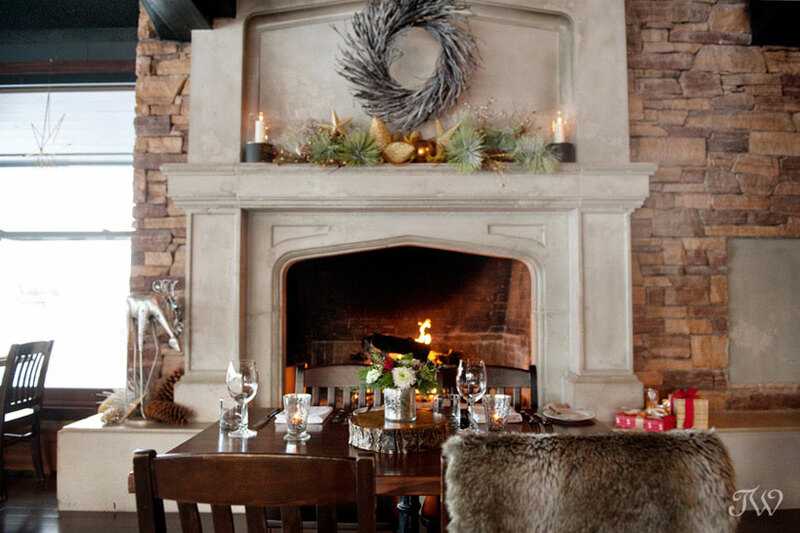 I photographed Bow Valley Ranche when they decked the halls for Christmas, take a look. I have such a special treat for you today. 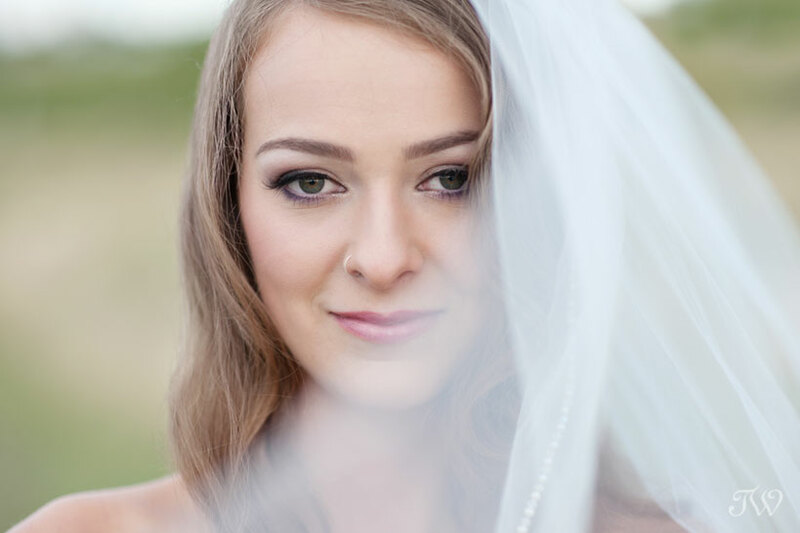 I contacted a number of my former brides with a bit of a homework assignment. 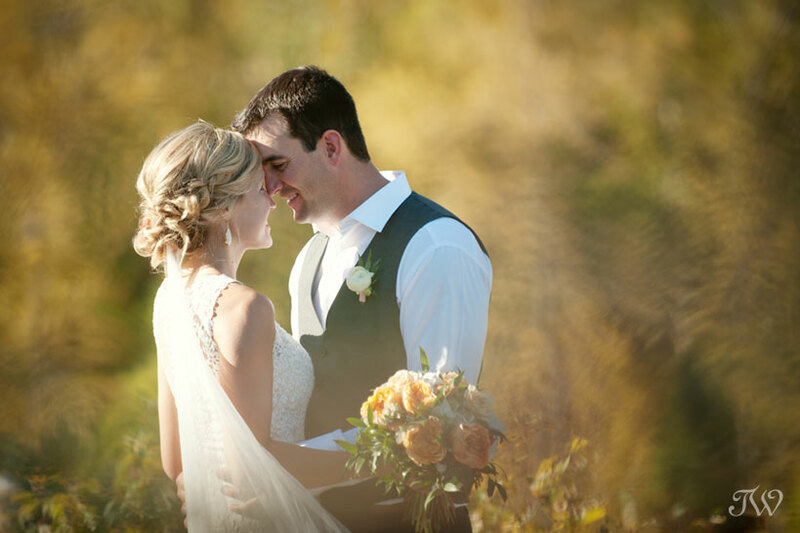 I asked them to think back and reflect on what they loved most about their wedding day and what they might do differently. 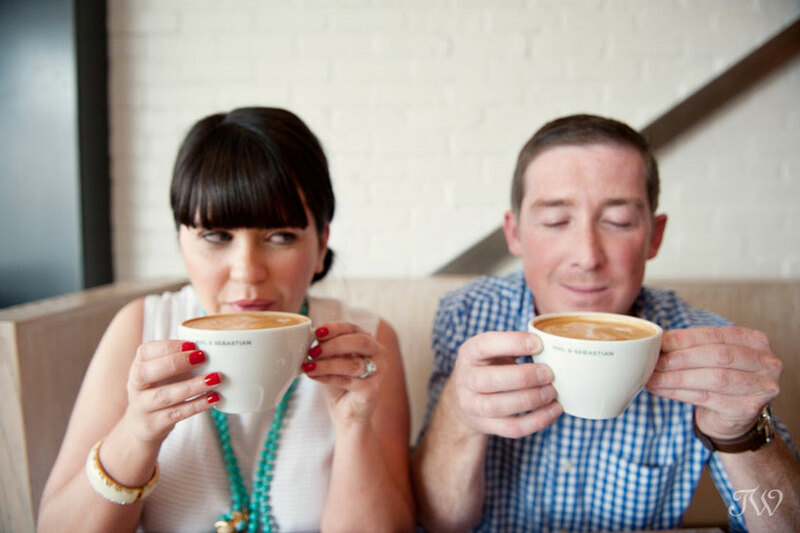 They were all so generous with their thoughts, so grab a cup of tea (maybe a tissue or two) and enjoy their sage wedding advice and heartwarming stories. 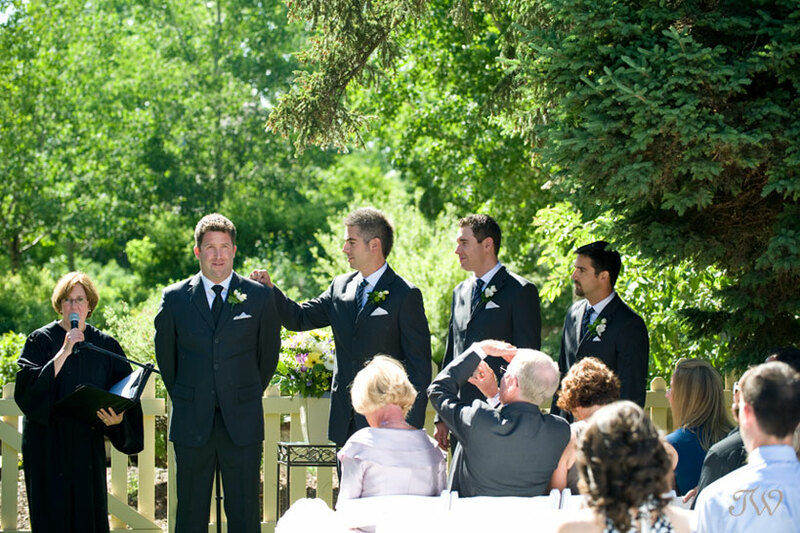 One of our favourite parts of the day was our ceremony which we wanted to be meaningful yet light-hearted. We both made a point of really trying to be present & in the moment – and, despite 115 people watching us, it truly felt intimate. 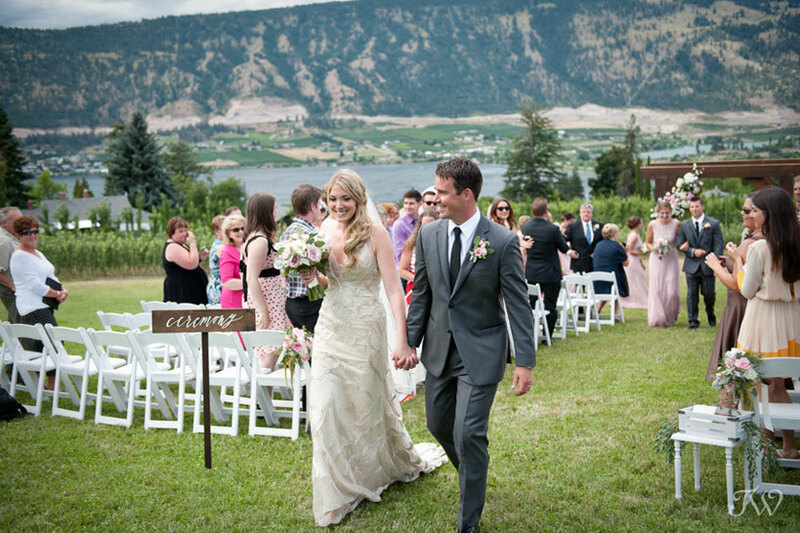 After the recessional I remember saying to my husband “that was fun!” and wishing we could do it all over again. 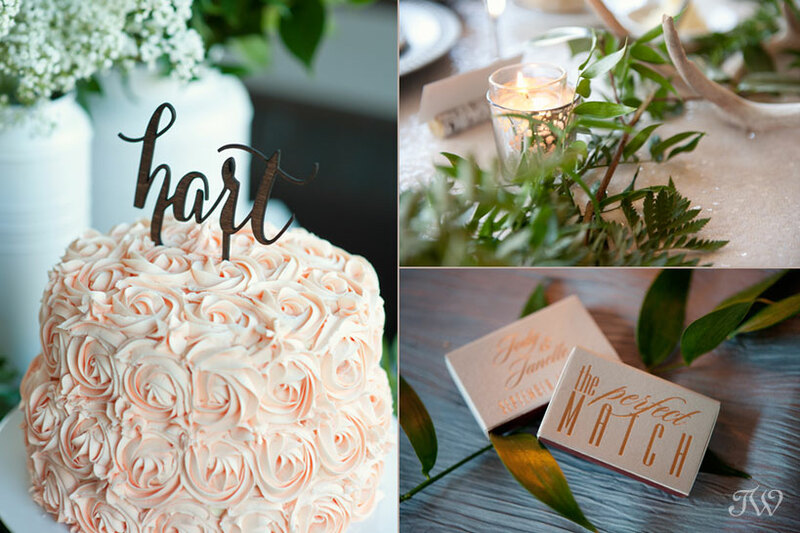 So many things could go wrong on your wedding day but it’s important to go with the flow and not let it affect the joy of the day. 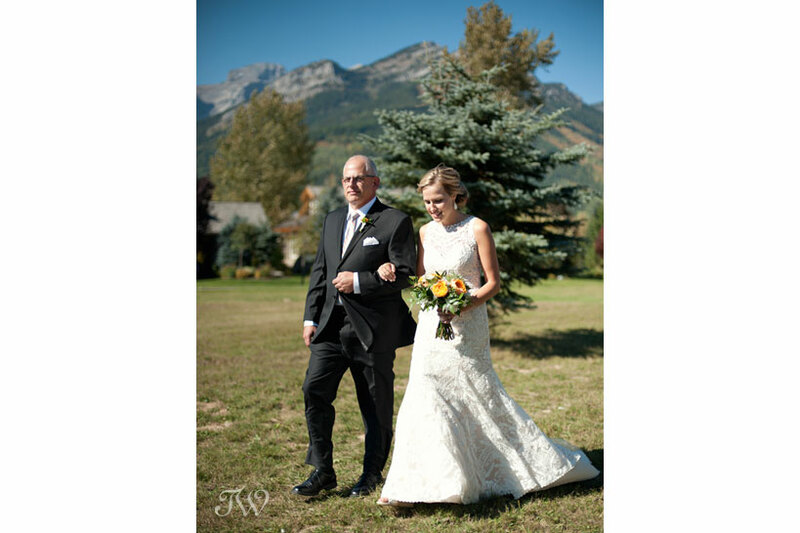 For example: the hook-and-eye on my dress broke while I was getting ready, my wedges literally fell apart while I was walking down the aisle, the arbour almost blew over onto us during our ceremony, my veil fell out while saying my vows – but with all of it we just laughed, sorted it out as best we could and look back on it as funny memories from the day. Our wedding day flew by. It was so amazing and I wouldn’t change a thing, I just wish I could slow it down! That’s why one of my favourite moments was when we had just signed for our marriage license and we had a minute together off to the side to whisper with each other while our witnesses signed. It’s important to steal those little moments and to remember them, because everything goes so quickly! What was your most favourite moment from the day? 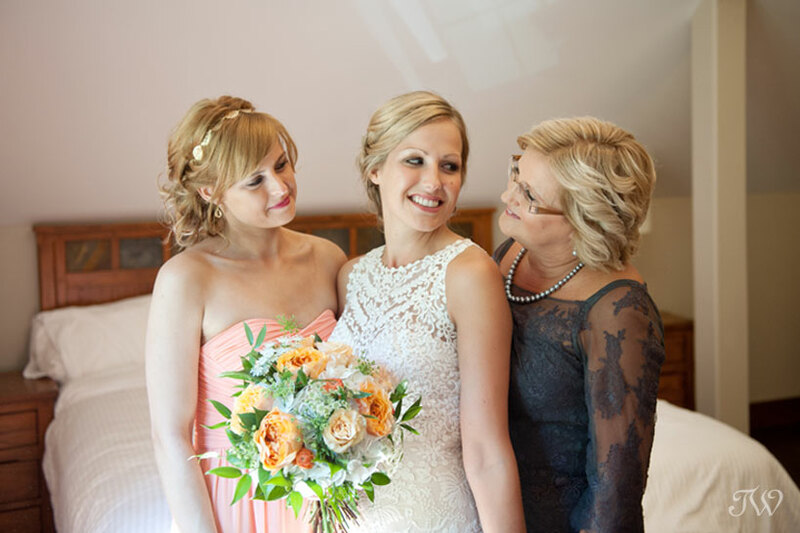 Getting ready with my bridesmaids! What would you do differently? GO TO MY SECOND DRESS ALTERATION APPOINTMENT! 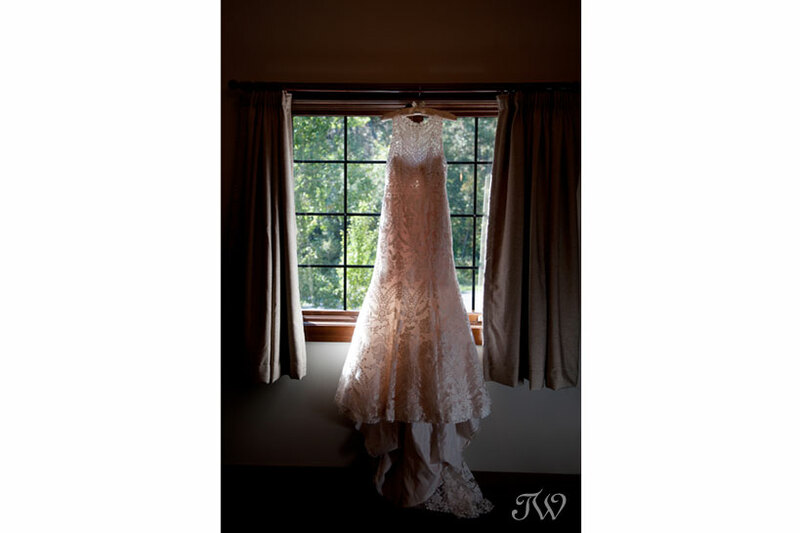 We booked the second alteration appointment, you know the one where you make sure it’s perfect? When that day came I skipped it thinking “its probably fine anyways”. Needless to say, it was not a perfect fit and I spent my wedding day trying to pop out my chest to fill the gap. 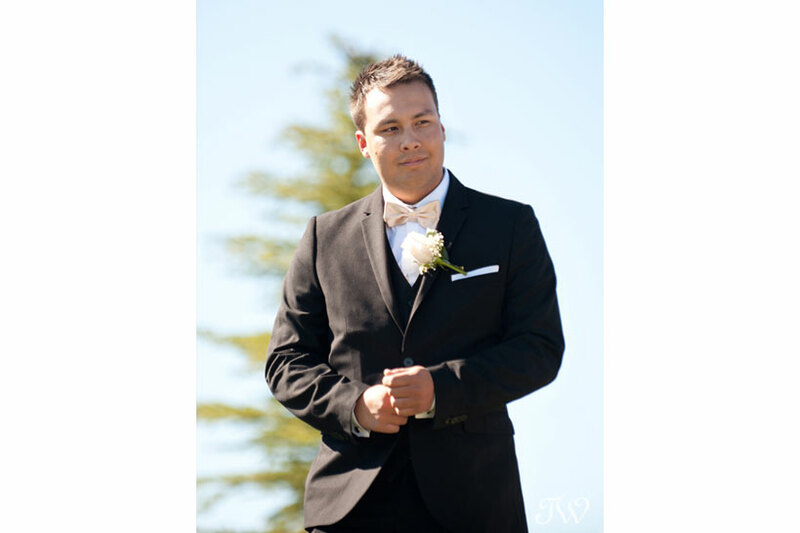 A lot of people ask me what I would do again if I was to do the wedding over. 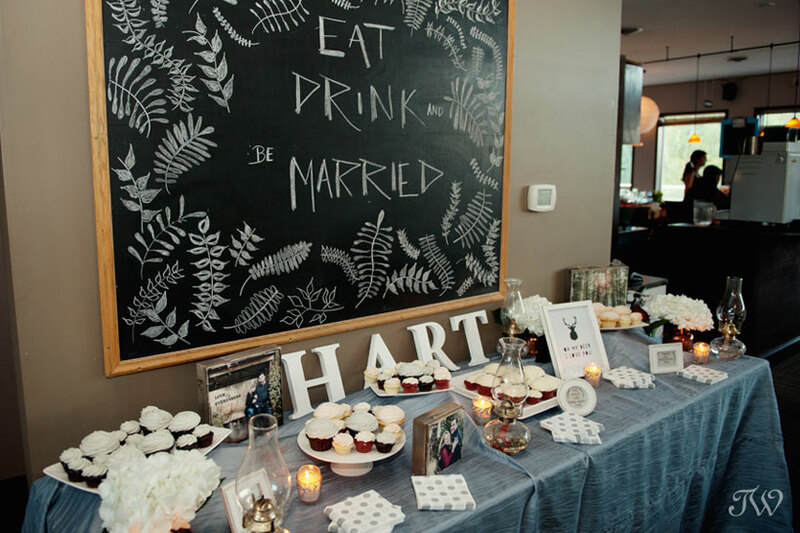 I did a lot of research into modern alternatives but we decided stick with a lot of traditional aspects of a wedding (e.g. 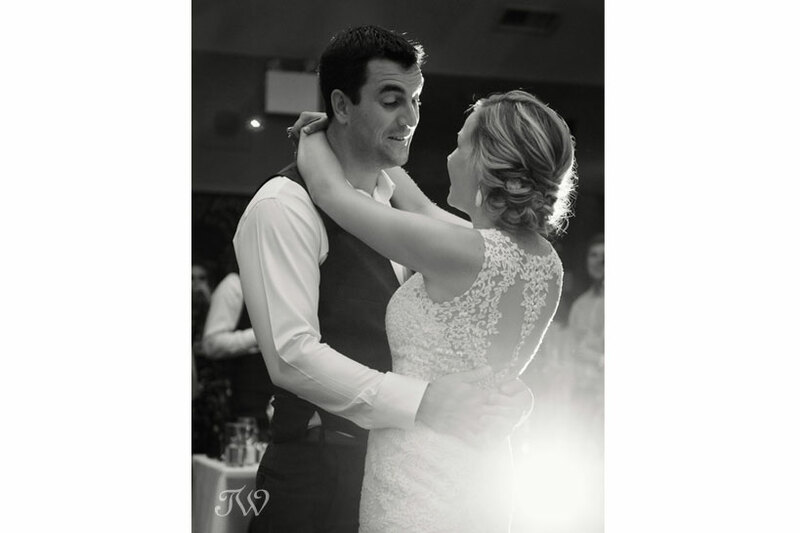 no first look, unity candle, father-daughter/mother-son dances). While I am not saying that this is for everyone, we did not regret any of it. These are a lot of the moments that I look back on most fondly. 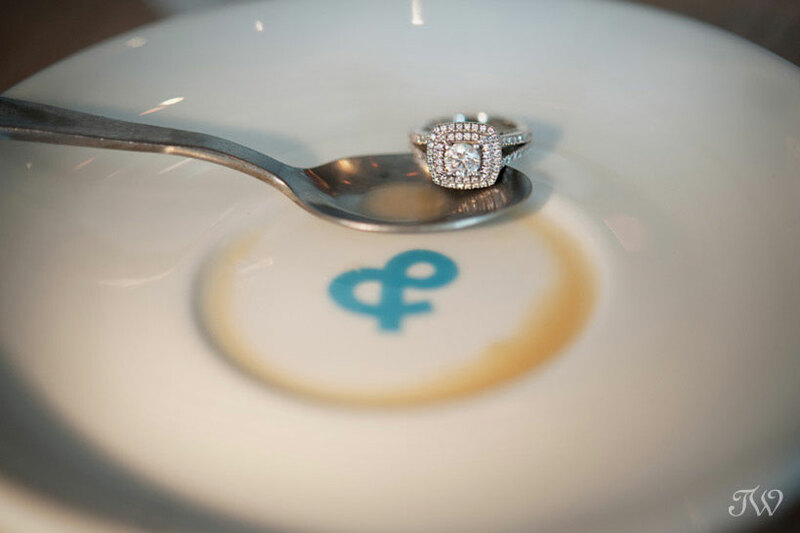 The toasts were also a highlight of the night. Every speech was funny and heartfelt and I found myself overwhelmed to have these amazing people in my life. Any funny stories? I broke the rear view mirror off the front windshield of Bryce’s 68 barracuda attempting to apply lip gloss on our way to the reception! It’s his other love, so I feel like if that happened on any other day, the results may have been a little different! 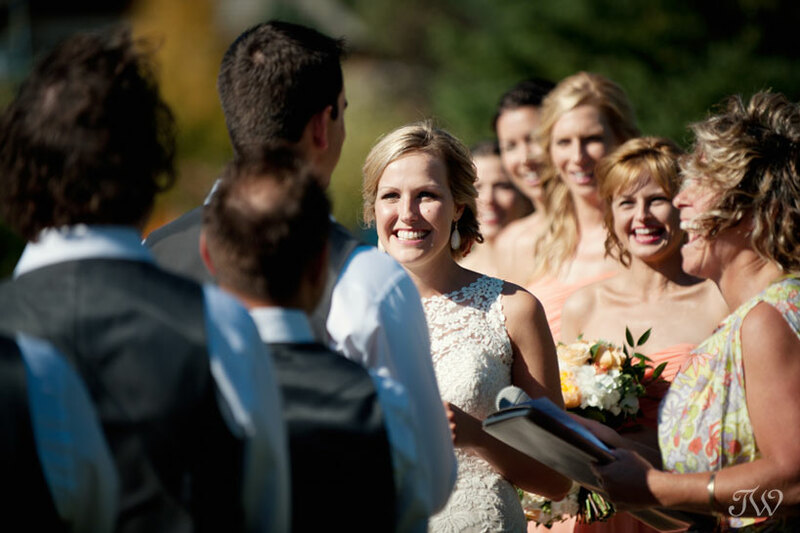 Having a small wedding meant more time with guests, and less time throughout the day. 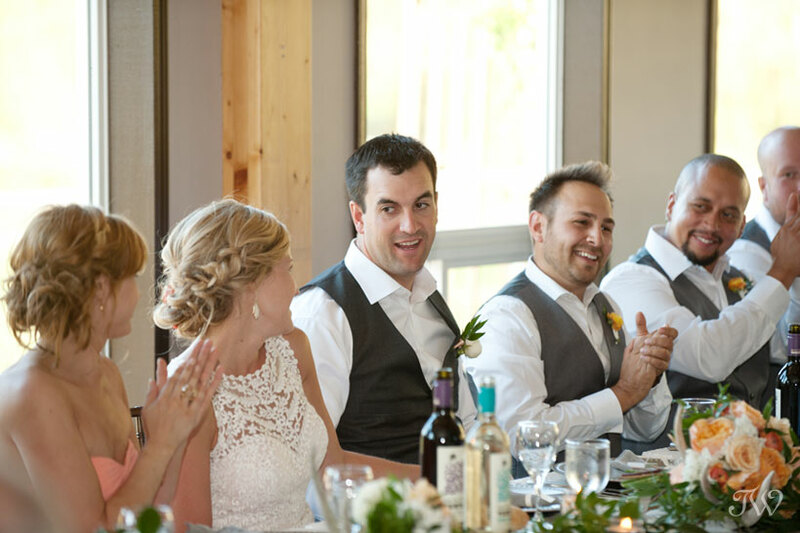 We absolutely loved being able to talk to each and every one of our guests. It was as if we were having a small quaint picnic of 50 people. There are a ton of things I would definitely do again, but I think that was the most important of all for us. Any funny stories? 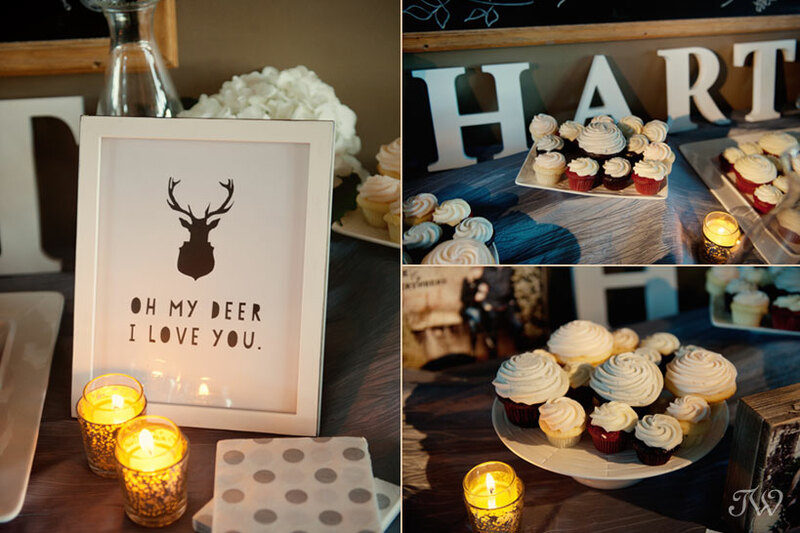 I had purchased a vintage step ladder to use in group photos, and to double as a cupcake stand. Super cute, super pretty. 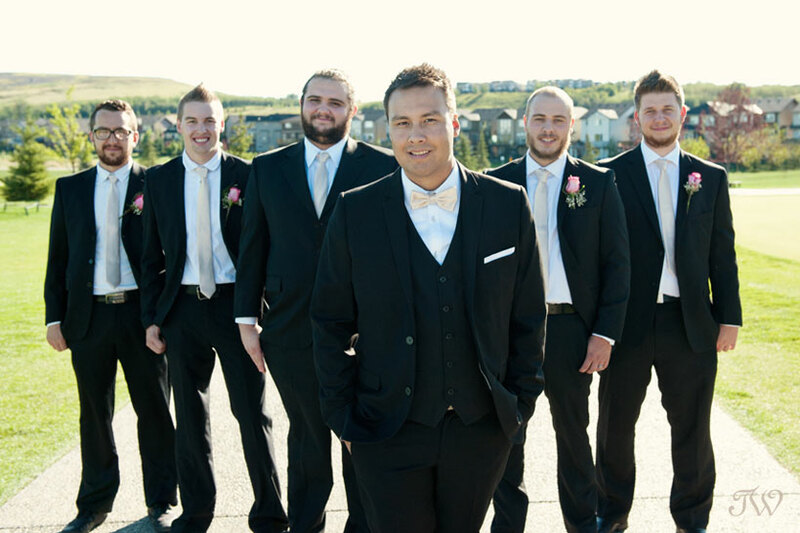 Note to all groomsmen…never assume vintage stepladders made of wood can hold any kind of weight. We all had a very good laugh at it, and luckily it only managed to get a crack in it. Favorite moment of the day? Having my Dad there to see our “First Look”. 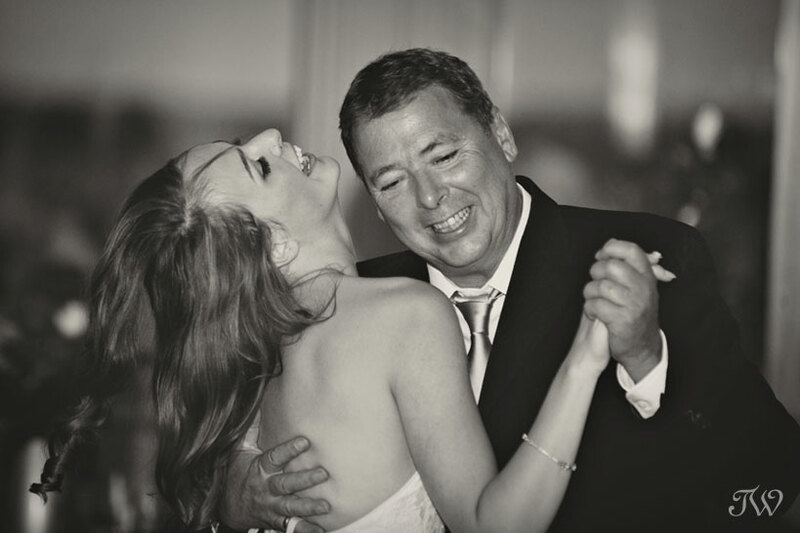 I couldn’t tell who had more tears, my groom or my father. 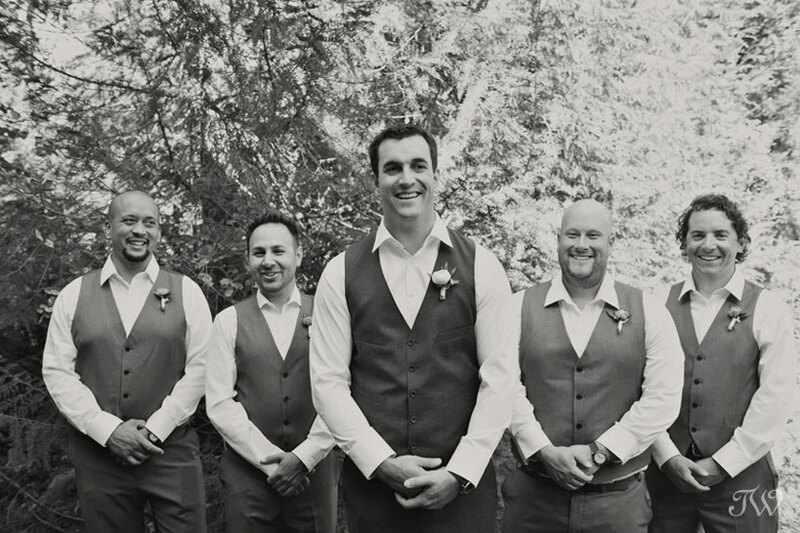 PS: A piece of wedding advice to all grooms out there…please remember your wallets from the photographers vehicle 🙂 You may be SOL on your wedding night, and that just wouldn’t look good, now would it? What would you do over again? First look, first look, first look. 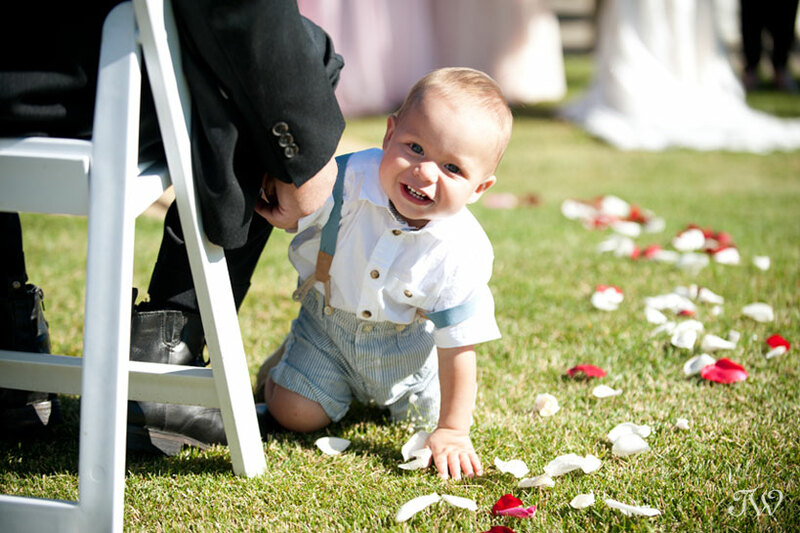 Having that time with Tyler before the ceremony was so incredibly special. It was so intimate and personal, and being able to spend some quiet moments together allowed us to focus on the importance of the day. 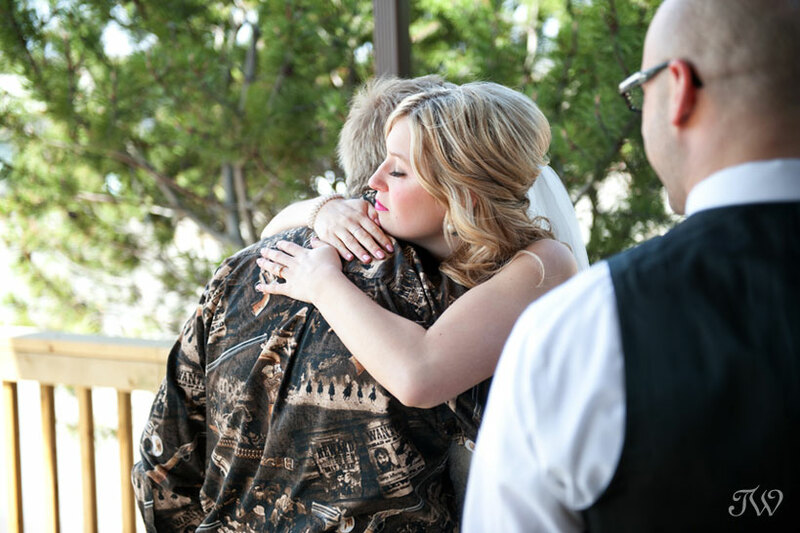 Bonus: I got most of my tears out before the ceremony which meant that I could really be in the moment when I was walking down the aisle towards Tyler! What would you do differently? 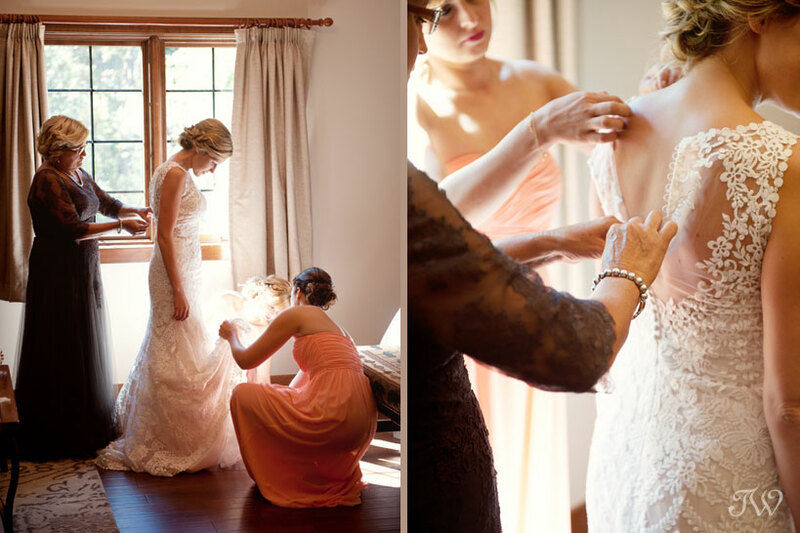 I wish I had thought to spend some extra time with my parents between getting dressed and heading to our ‘first look’. 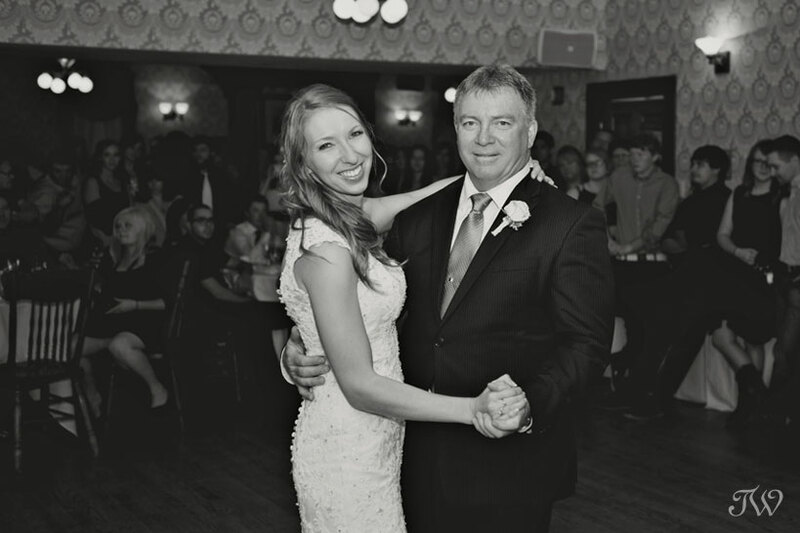 I was so fixated on sticking to our timeline that it wasn’t until the next day that I realized I had rushed my Dad through what was surely a really important moment for him – seeing his daughter in a wedding dress. He was a good sport about it when I brought it up later, but it would have been really nice to have spent time in that moment. Any stories you’d like to share? 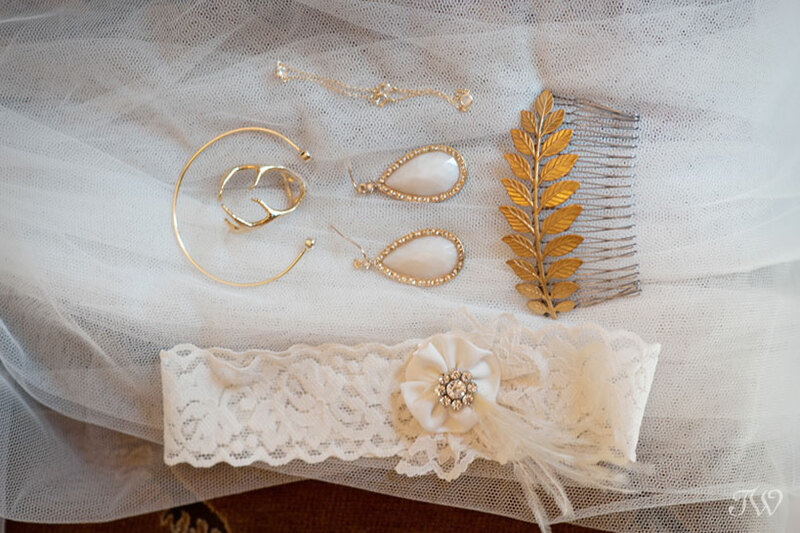 After our first look we were walking on the train platform and my something old/something blue – a charm from my late grandmother’s bracelet – came off of my dress somewhere along the way. The groomsmen came down to look for it, but after 20 minutes I decided that it was kind of nice that a little bit of my grandmother’s memory would stay at the spot where Tyler and I first saw each other on our wedding day. Tyler knew that the charm was really special to me, and that even though I had tried to make the best of losing it I was a little bit sad. He went back a month later and crawled along the platform with a flashlight looking between each gap until he found it. Then he spent a half hour fishing it out with a twig. Best. Husband. Ever. Favourite moment? Tyler surprised me with an after-dinner speech recounting our entire relationship in the form of a 3 page limerick. And what did I do? I showed up to it late! 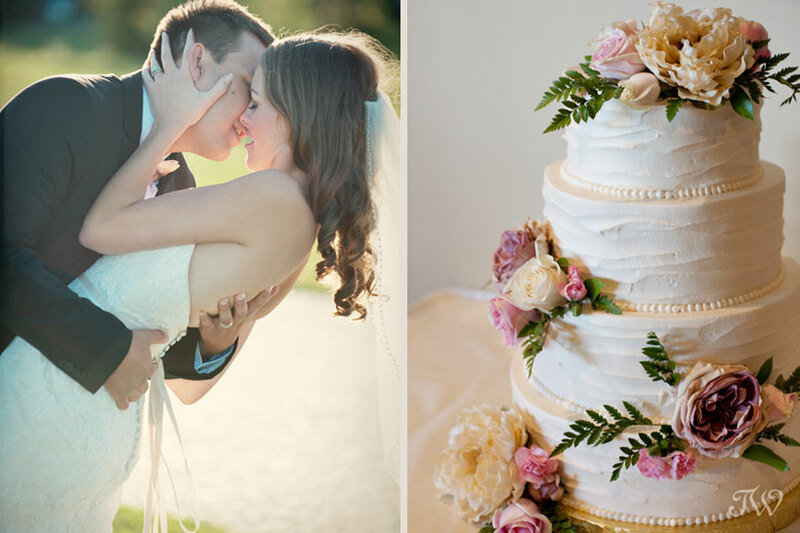 What’s the best wedding advice you would offer to brides? 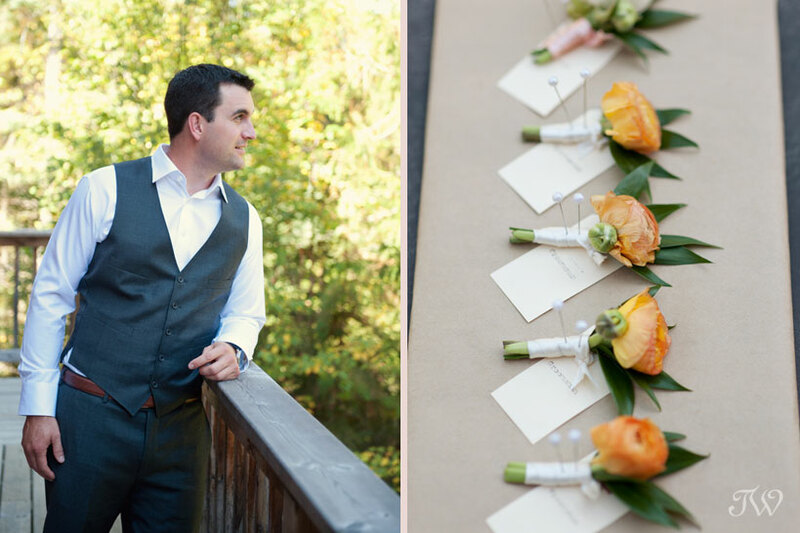 DO include your groom in the planning! We had such a great time planning our wedding together, bouncing ideas off the other, visiting potential venues and calming each other down when needed! It made the day so much more special as it was something we had done together and could be proud of. 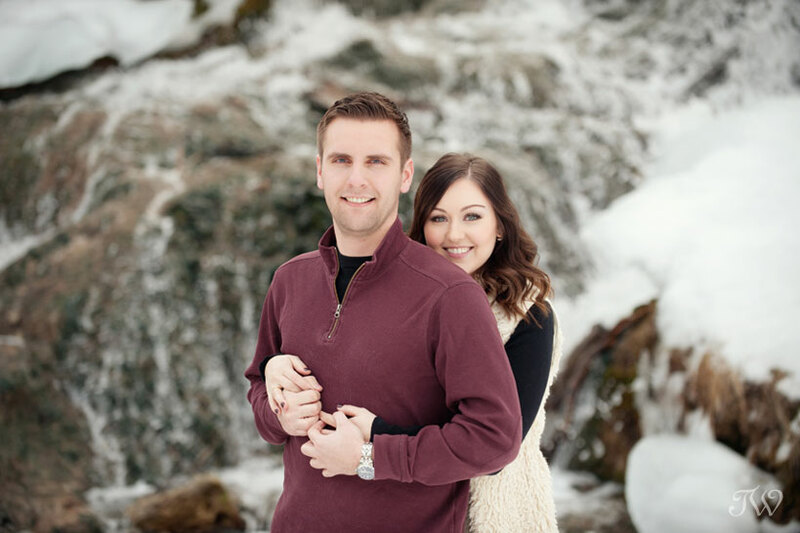 Planning a wedding is a TON of work but doing it together made it fun! 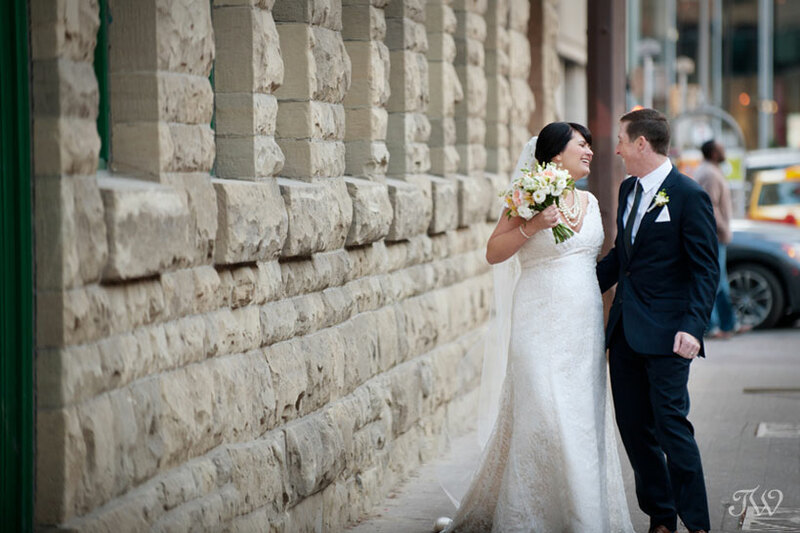 We had a moment standing at the top of the stairs just the two of us before heading into our reception. 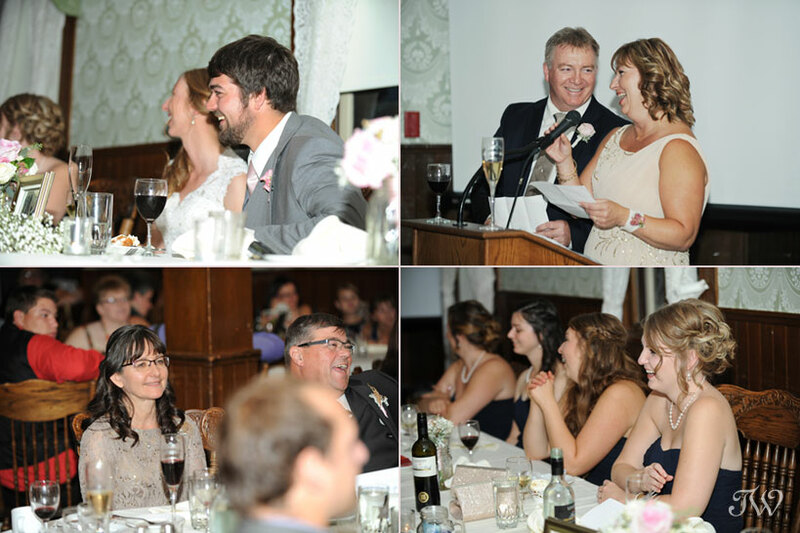 You could hear all the laughter and talking and general good time of the guests. 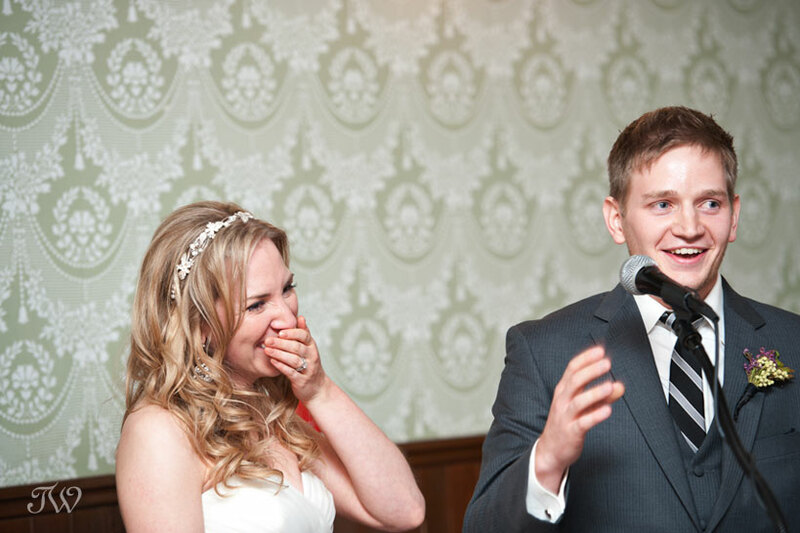 We both just looked at each other and breathed a collective sigh of happiness and relief, we were married, the day had been amazing and our guests were having a fantastic time celebrating our love. It was very moving to think of all the people who we love and care about in one room laughing and having a great time in celebration of our love. 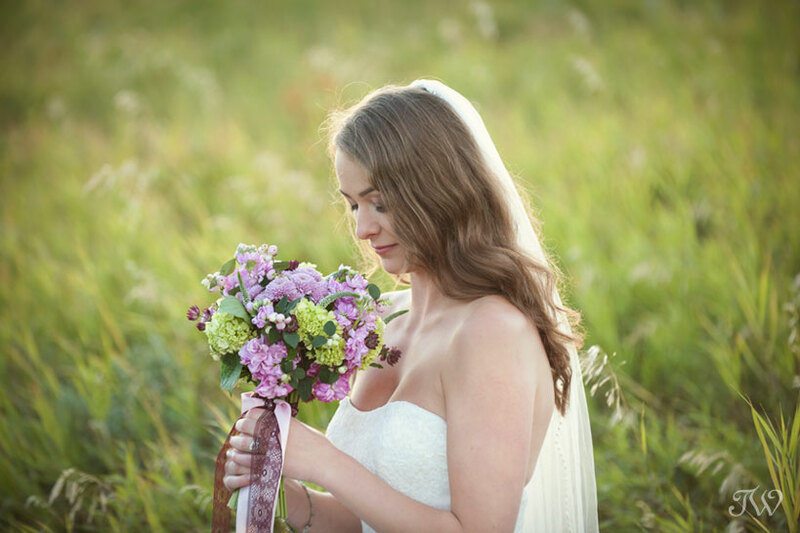 I’d advise future brides to breathe and enjoy the day. 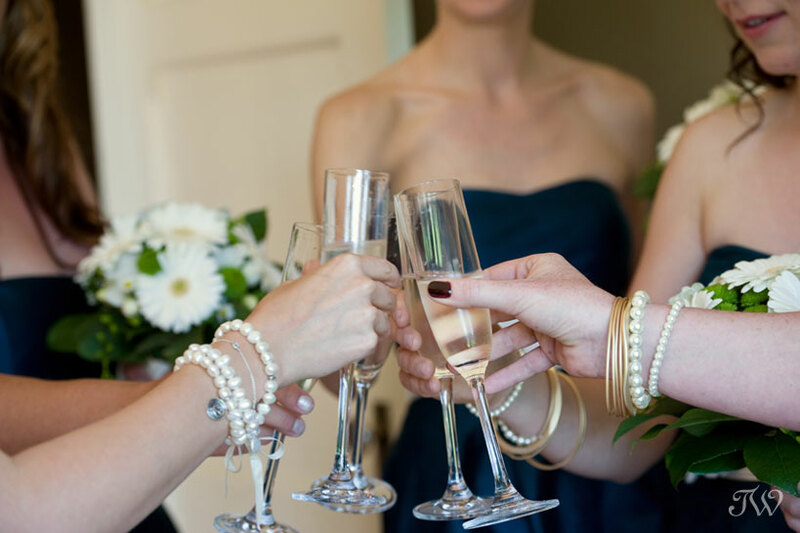 Have fun in the planning process and also on the big day. Don’t sweat the small stuff. If something goes wrong, you are surrounded by family or friends always willing to help! The day will go by so quickly that it’s over before you know it! 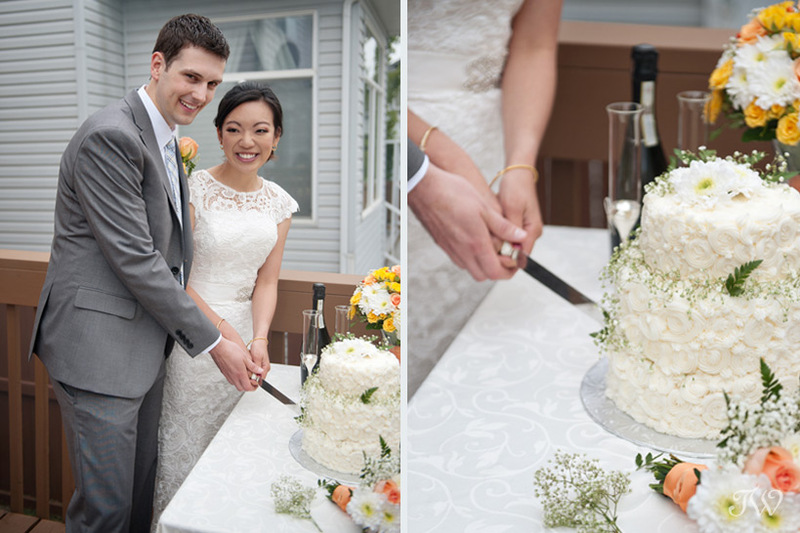 My favorite moment was cutting the cake, I was so proud of my home-made cake. It was such an accomplishment baking the fruitcake and I enjoyed decorating it. 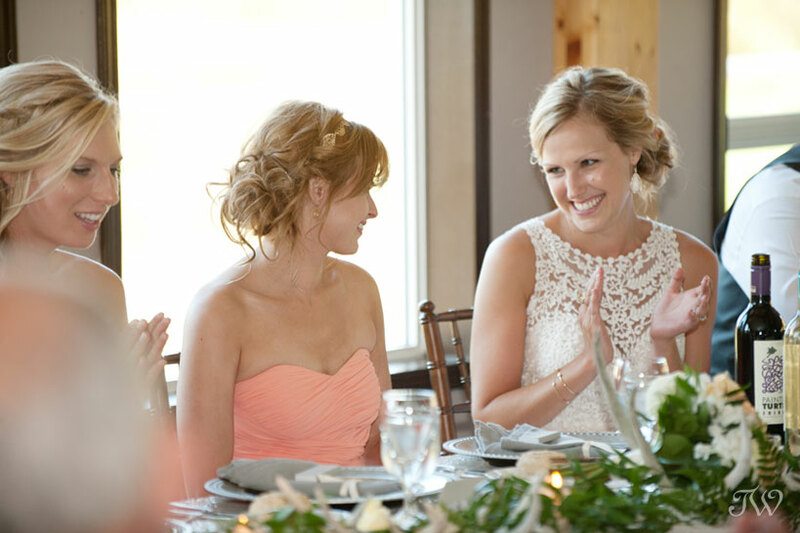 Thank you ladies for sharing your memories and wedding advice to couples planning their own weddings. 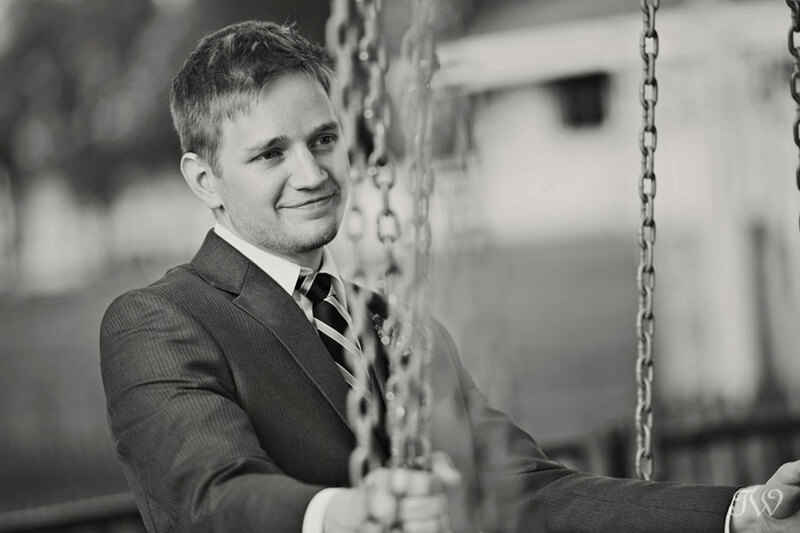 I loved putting this post together and hearing your point of view. 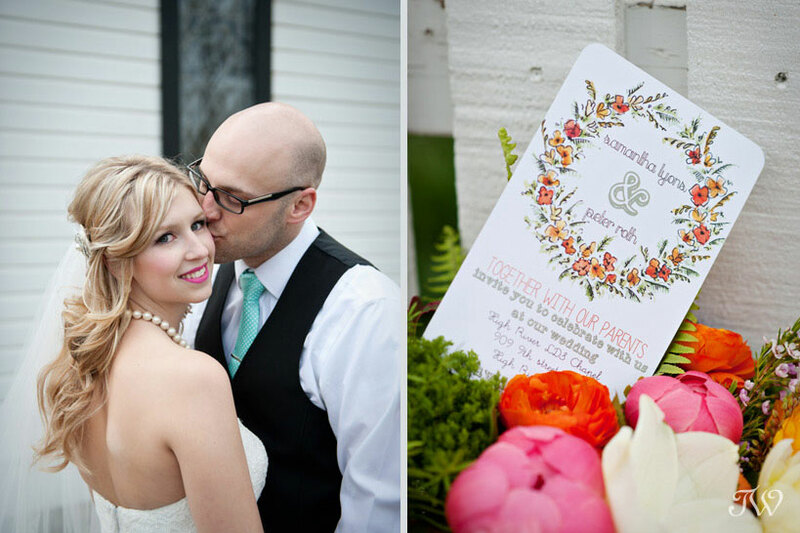 On a chilly January day, scrolling through these images has me yearning for summer, how about you? 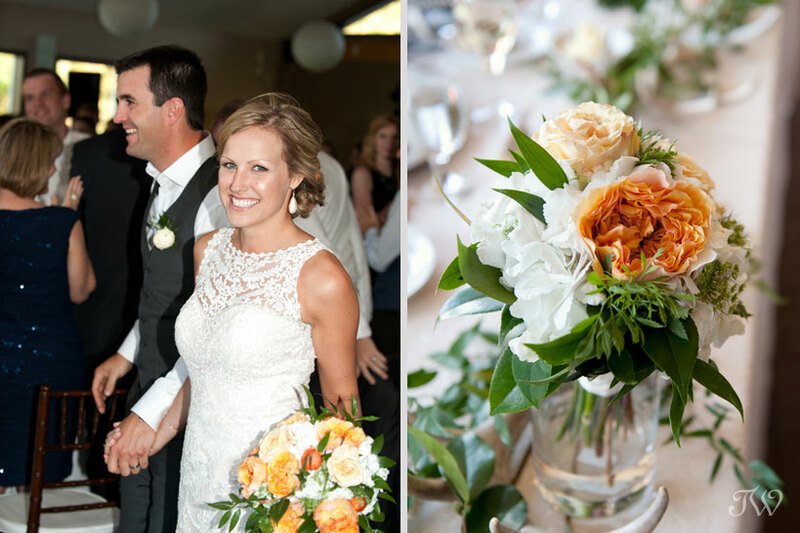 It was a treat to be Sadie and Vic’s Blue Devil Golf Club wedding photographer last season. 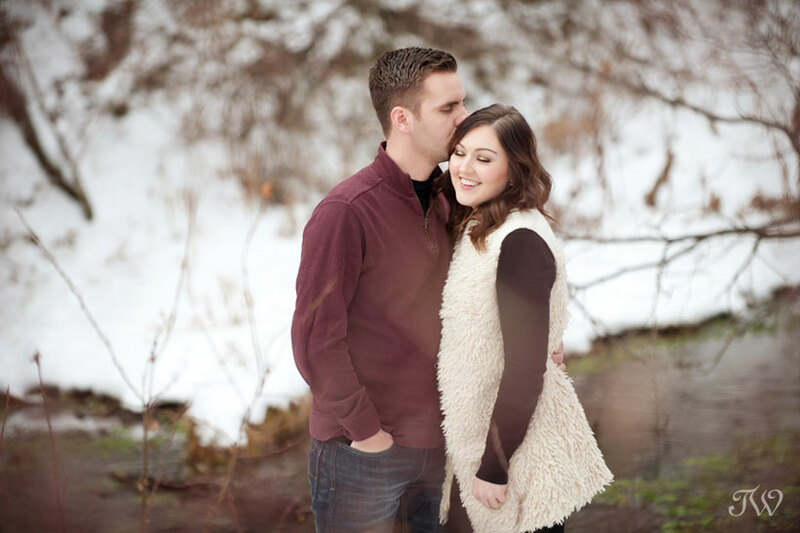 They are a sweet, thoughtful couple and Sadie has a laugh that will light up a room. 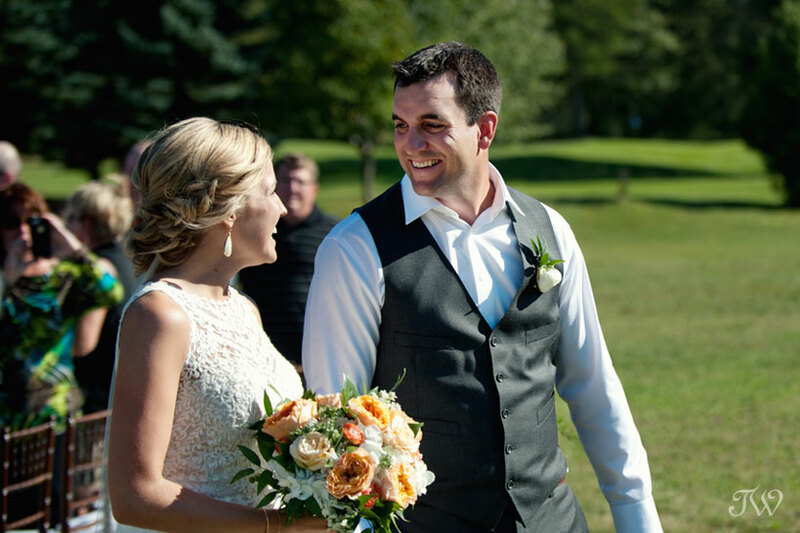 Their wedding took place on a perfect August day, overlooking the golf course and surrounded by their friends and family. I felt fortunate to capture the festivities and I wish the best to you both in 2016! Brenda from Cakeworks is one of my favourite people. 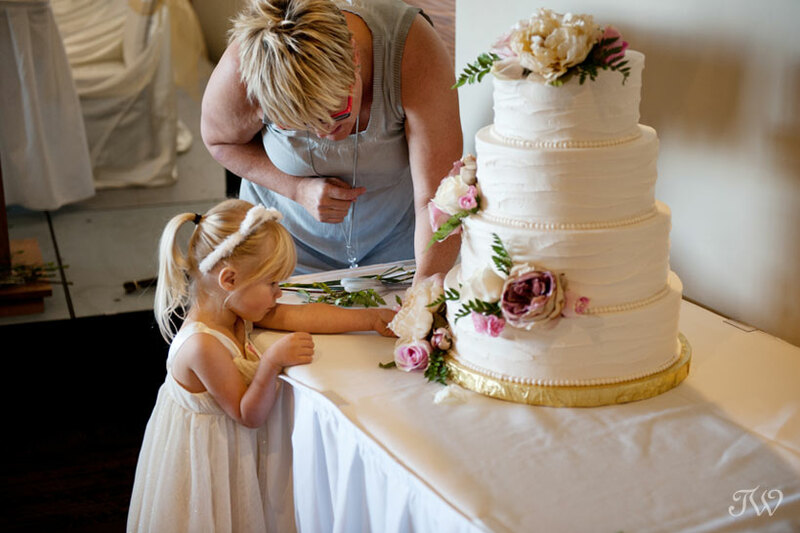 Here she and the flower girl put the final touches on Sadie and Vic’s wedding cake right before the wedding ceremony. 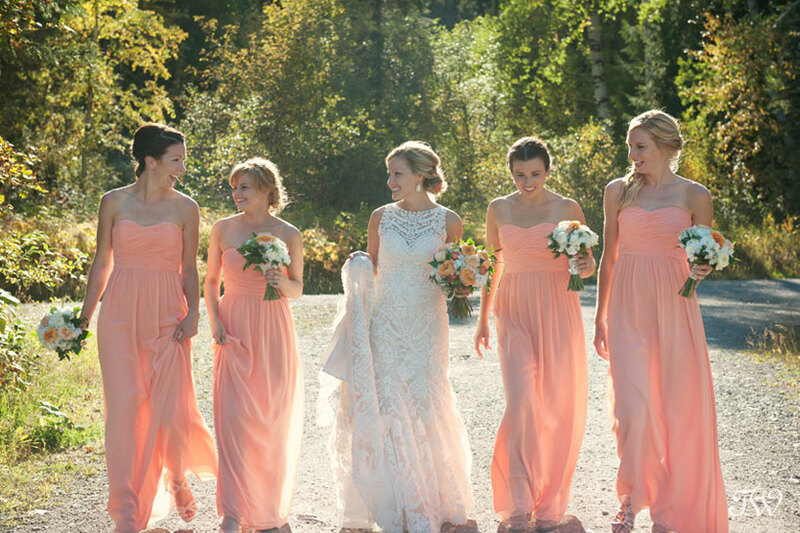 Sadie and her beautiful bridesmaids. Ladies, you’re just too much! On Father’s Day, be prepared to see this image on my Instagram account. I love the big smiles and the pure joy during Sadie’s first dance with her Dad. 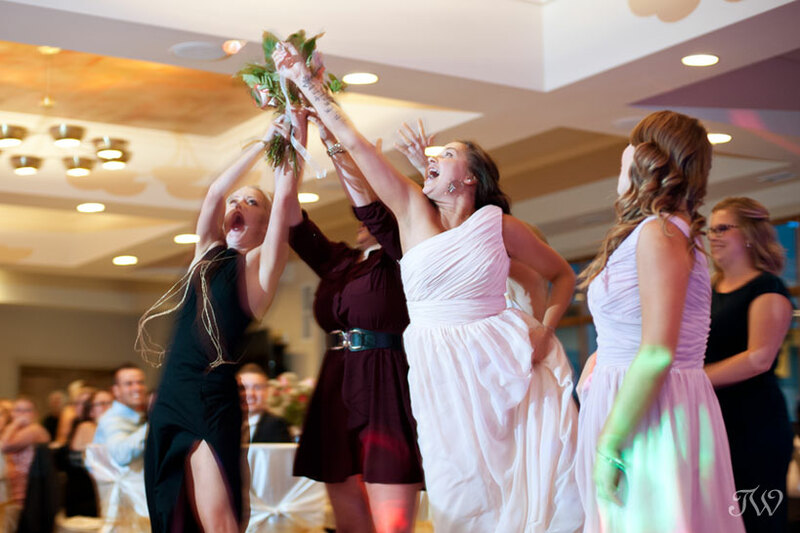 Wedding reception fun…a great capture by my second shooter, Kacie. 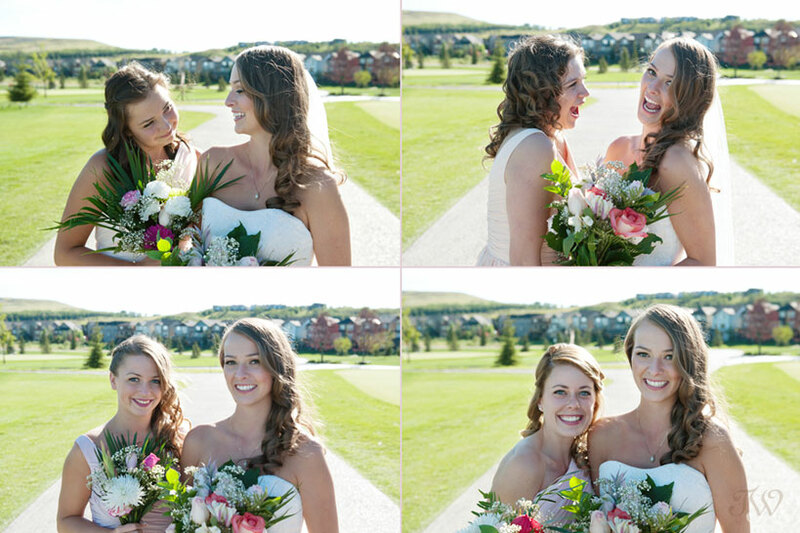 Sadie and Vic opted for a “day-after” photo shoot in Nose Hill Park which gave us more time together. 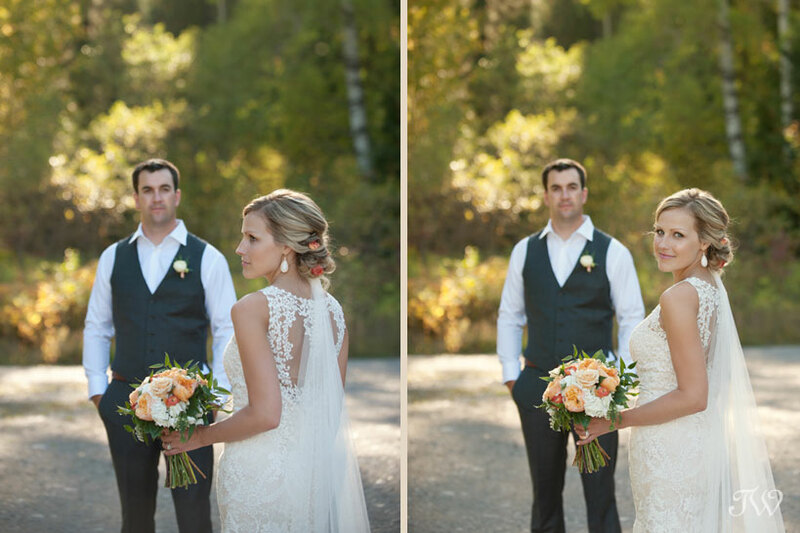 The light in the park that night was a photographer’s dream and I’m pretty smitten with this first image. A big thank you to Janelle from Flowers by Janie and Lyana from The Art of Beauty for making this evening so special for Sadie and Vic. 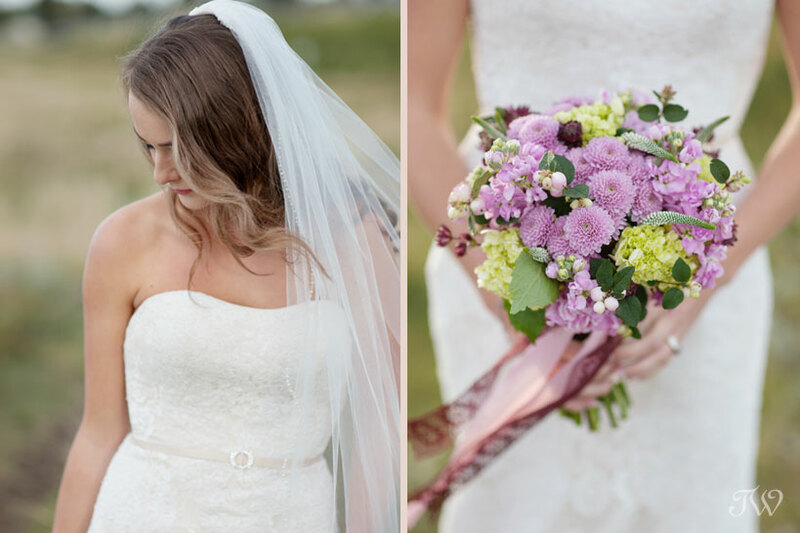 I love Sadie’s bridal bouquet from Flowers by Janie. 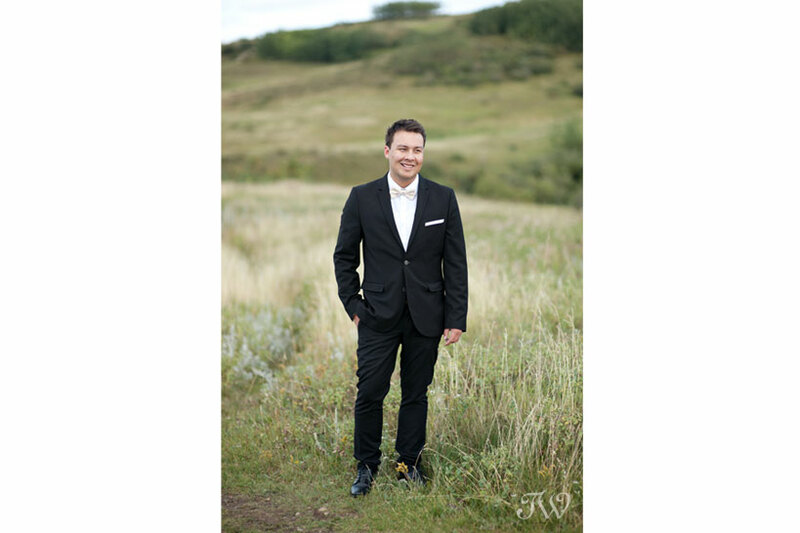 Sadie and Vic’s day-after session in Nose Hill Park was featured on the Calgary Bridal Alliance blog not long ago. Take a look! 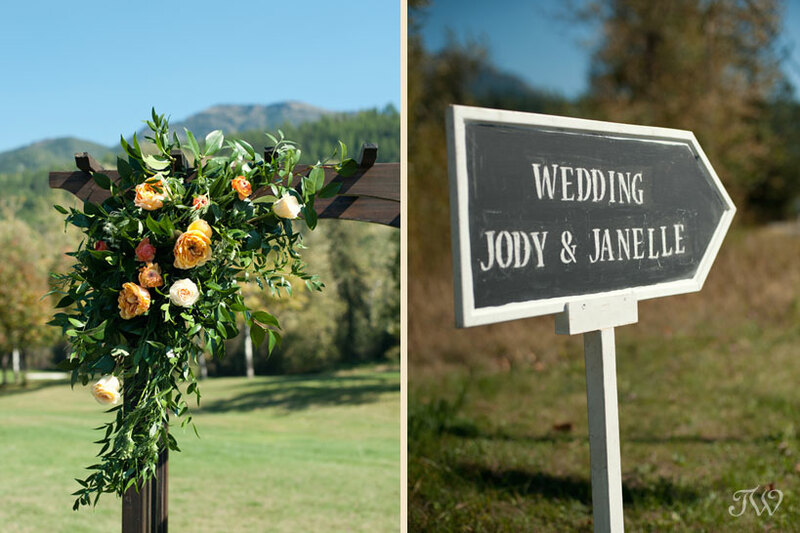 Here’s more outdoor wedding inspiration, if you’d like to see. 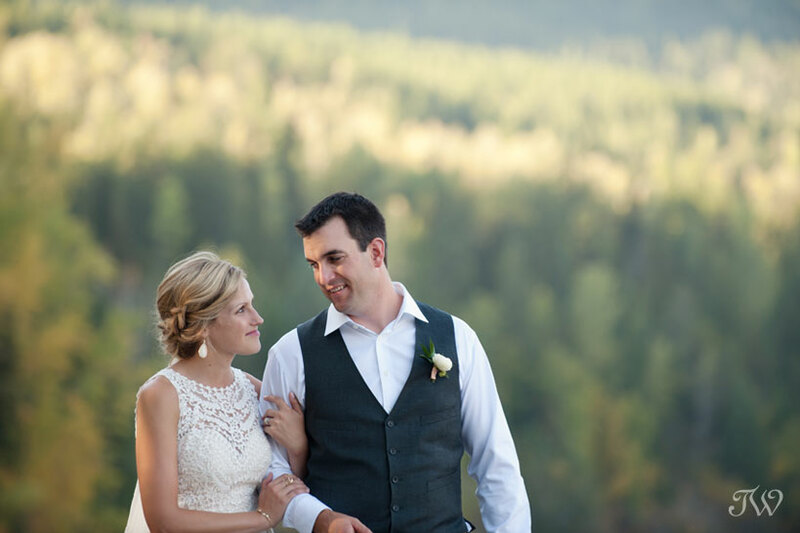 Nicky and James tied the knot in a rustic, outdoor ceremony at her family’s ranch near Okotoks. 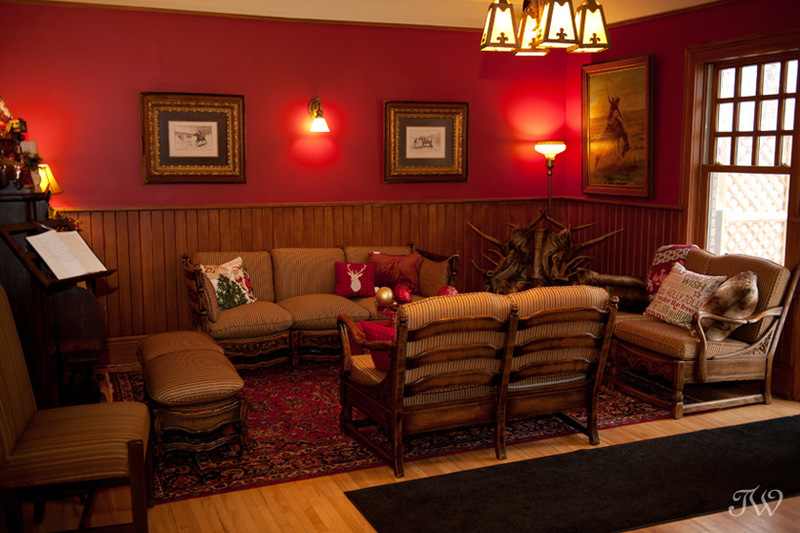 When I first heard that Canadian Rocky Mountain Resorts (CRMR) was renovating the former Inn at Lake Bonavista, I was excited to see the final result. 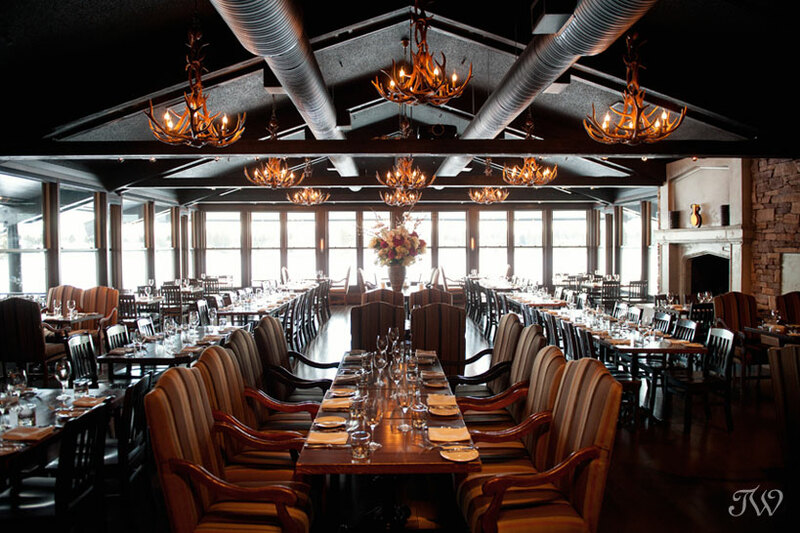 Known for their spectacular venues and exceptional cuisine, CRMR gives each of their guests a true taste of Canadiana. The Lake House is no exception. 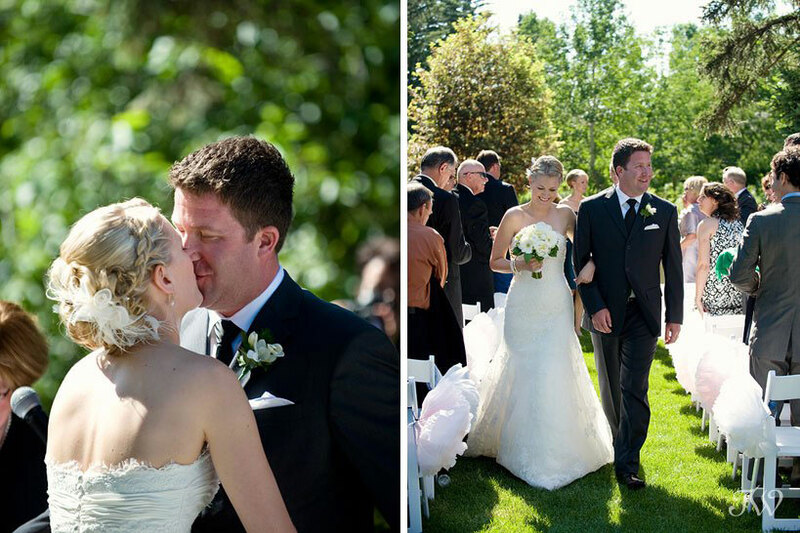 Warm, inviting, rustic and elegant…The Lake House has become a popular wedding venue in Calgary. 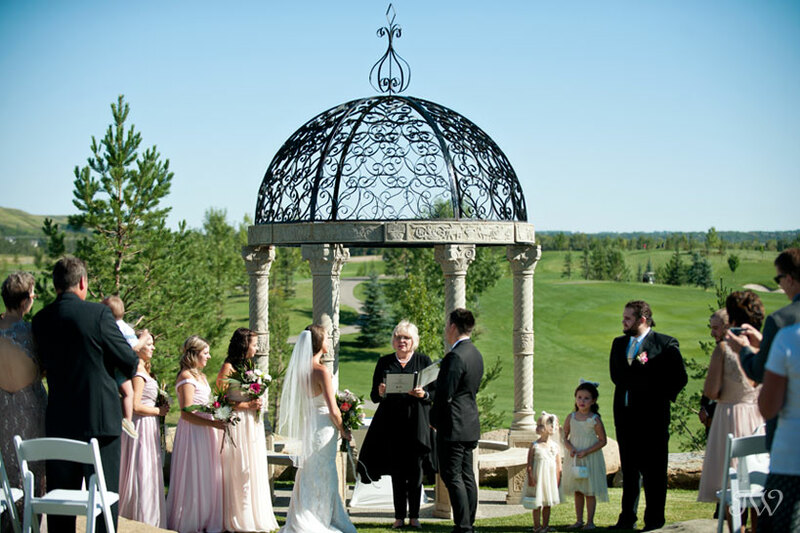 Last week I had the pleasure of meeting Pamela Bigg and Kirsten Davies from CRMR to find out what makes a Lake House Calgary wedding so special. 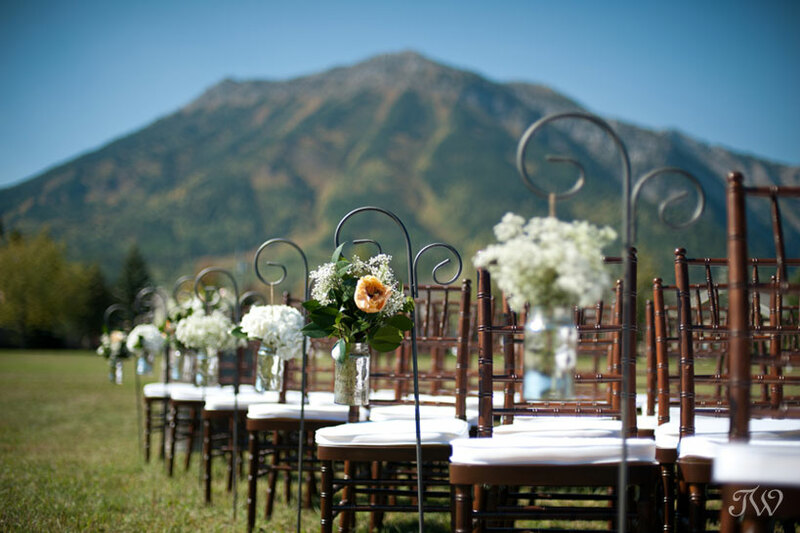 If you’re on the hunt for a venue for your upcoming wedding, read on. Tell us about The Lake House and how it came to be a part of CRMR? 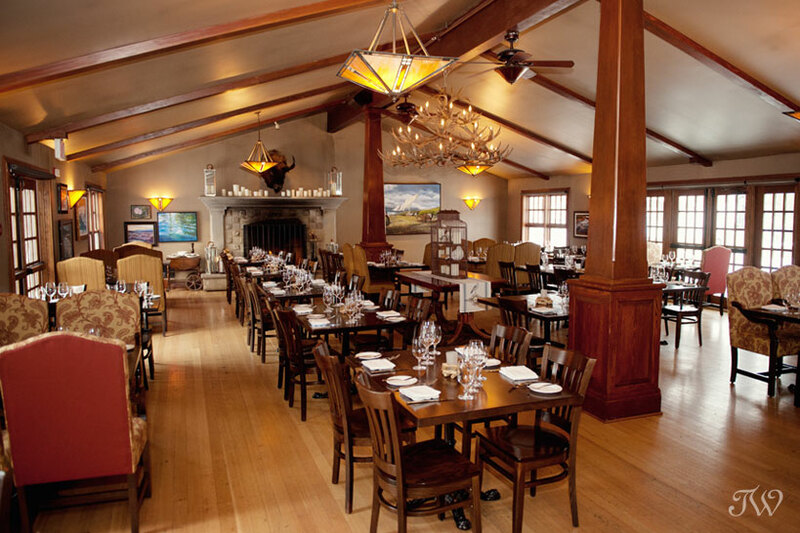 CRMR took over the former Inn at Lake Bonavista in September of 2013. 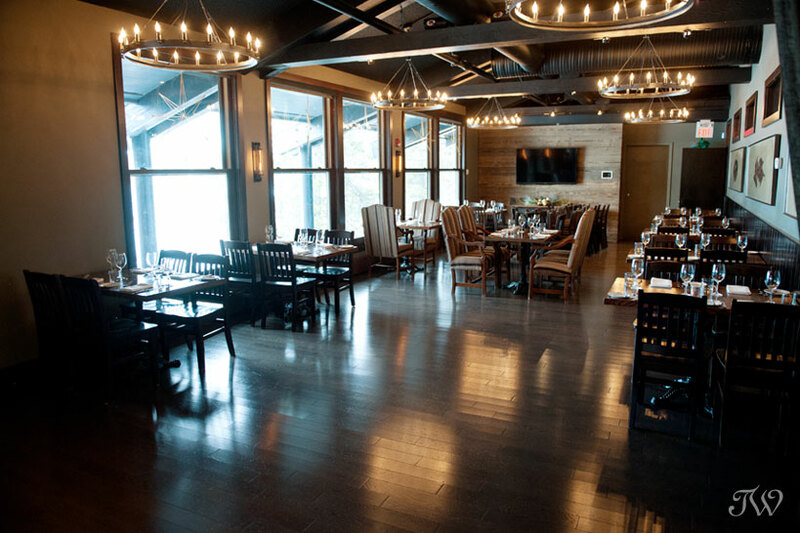 As the only lakeside restaurant in Calgary, they were drawn to the expansive open space and of course the spectacular views. 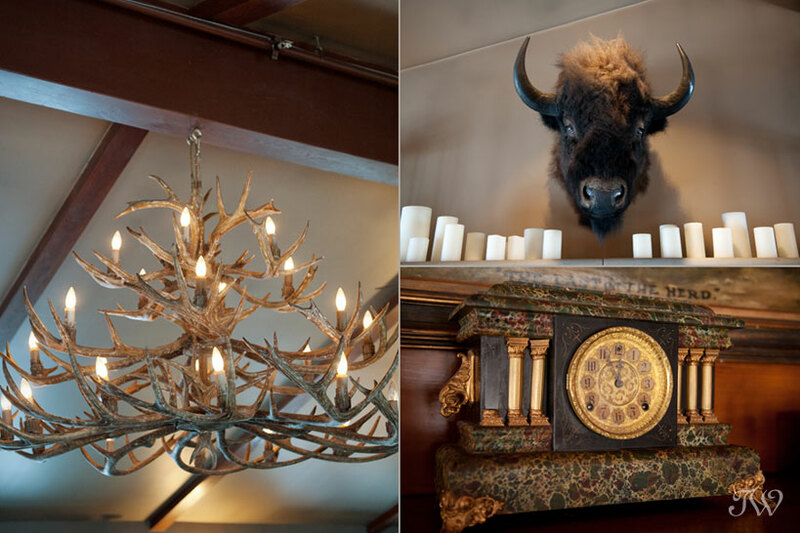 They’ve created a charming yet sophisticated atmosphere with ornate elk antler chandeliers and a grand stone fireplace. What are some features that make The Lake House unique? The view. The Lake House is situated on the shore of Lake Bonavista and banks of windows overlook the water. 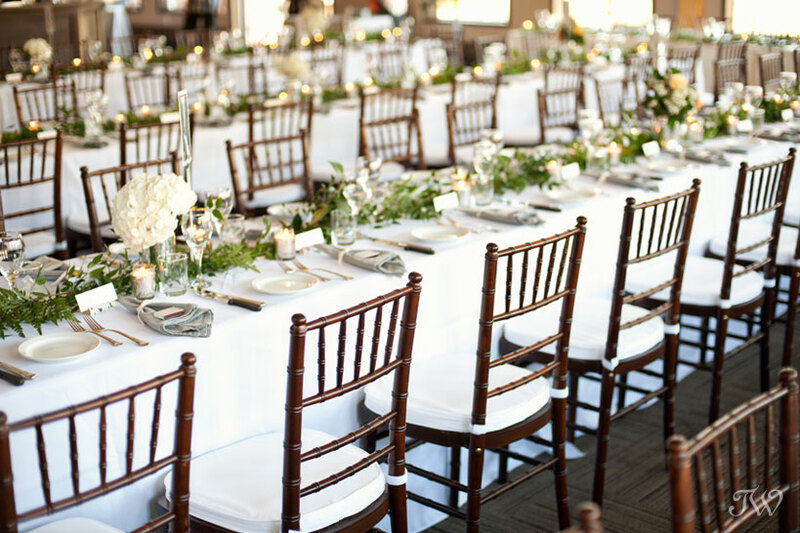 During the day, the dining room is flooded with beautiful natural light, making it the perfect setting for a wedding ceremony. At The Lake House the focus is the food. 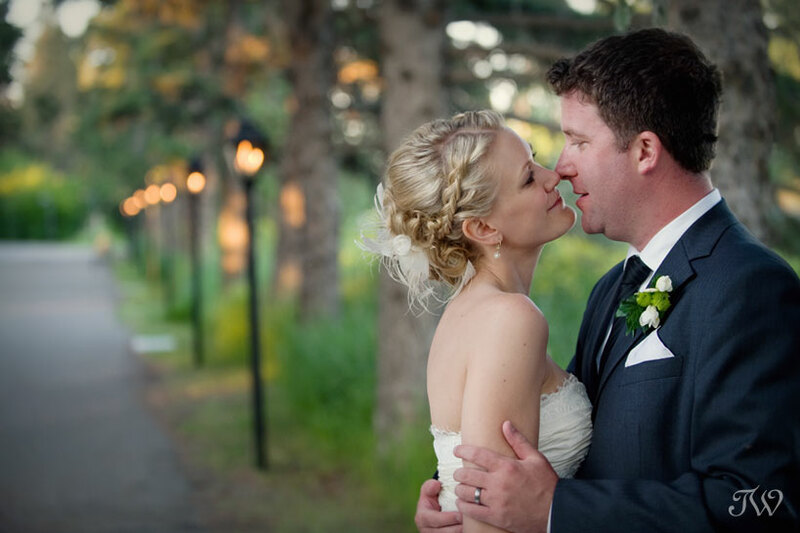 CRMR is known for their creative Canadian cuisine and couples can expect restaurant-quality food at their weddings. 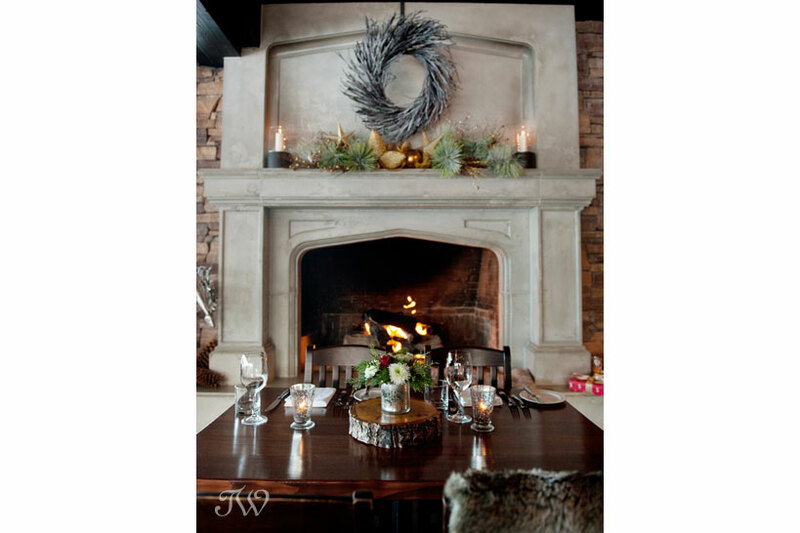 I had the pleasure of photographing a Christmas feature at The Lake House with Naturally Chic Weddings and some of the images are featured below. 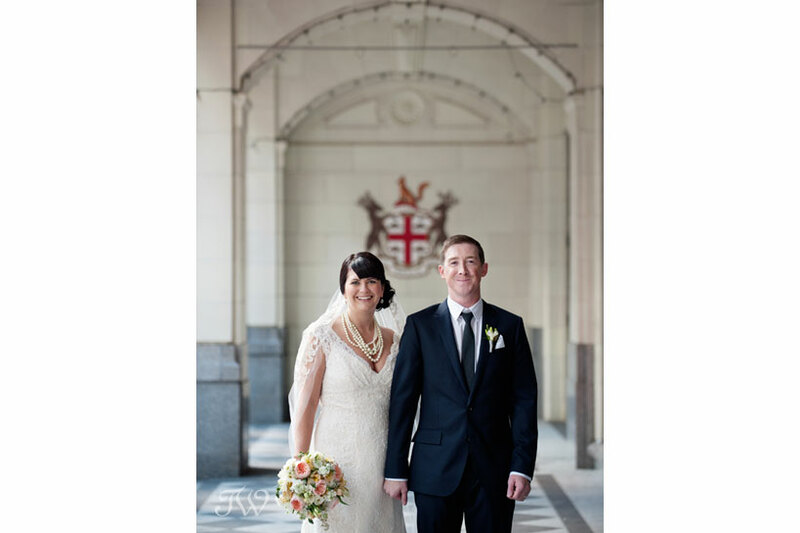 Additional credit to Ed Williams Menswear, Adorn Boutique, Diva Salon Spa, Flowers by Janie. 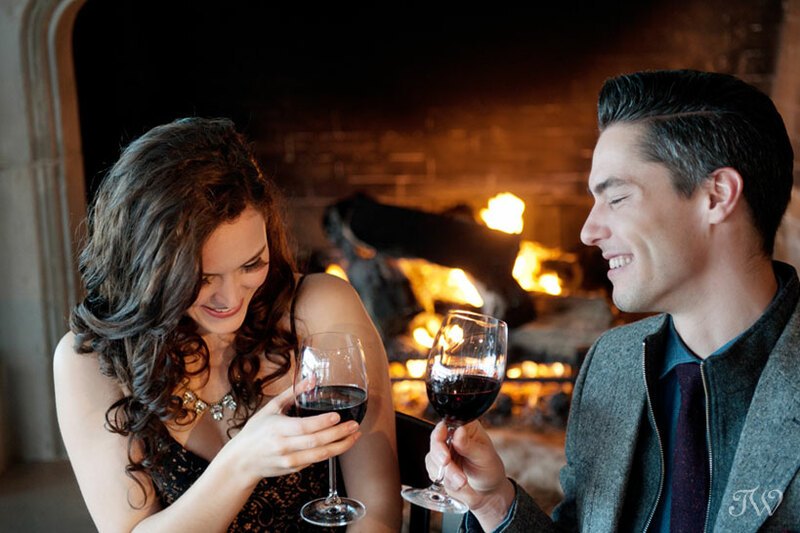 The Lake House is perfect for couples that are passionate about a great culinary experience and appreciate the beautiful space and views. 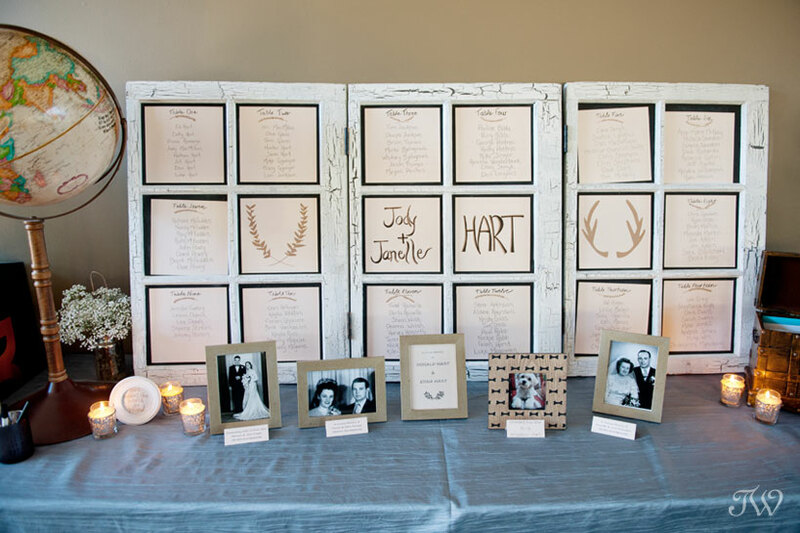 Tell us about the menu options that are available to brides and grooms? 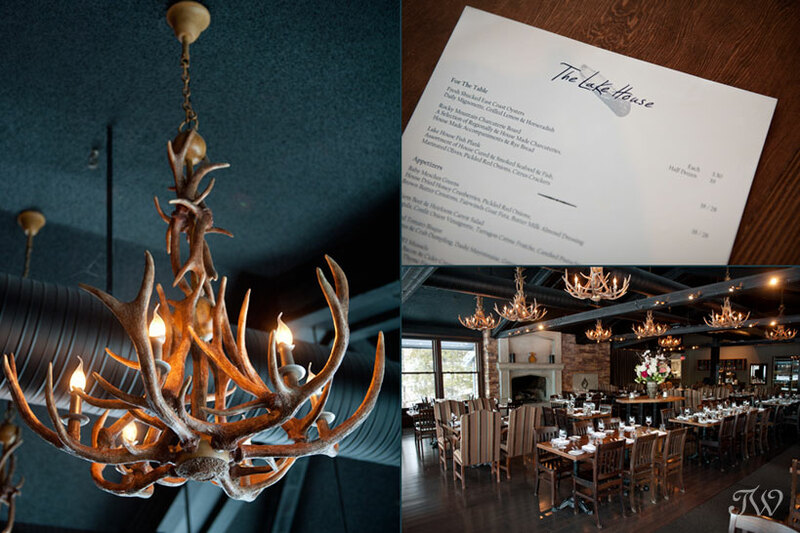 Chef Thomas Neukom provides a unique dining experience using sustainable and Alberta-raised game. 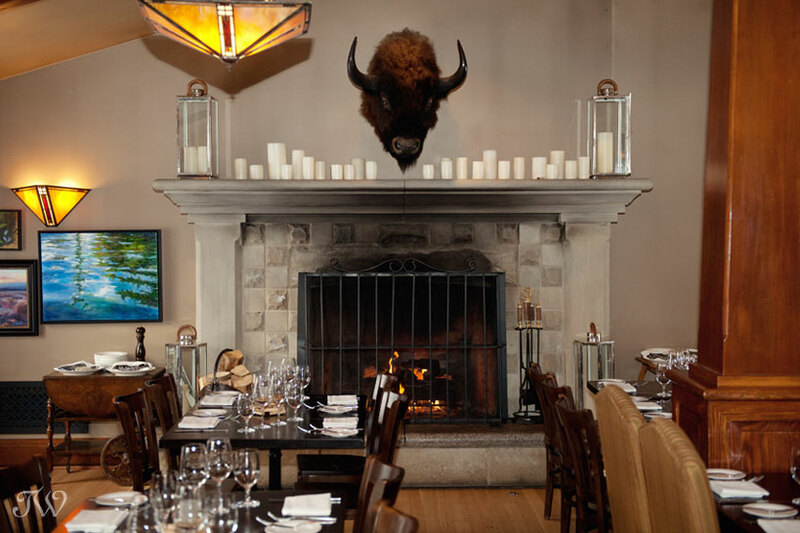 In fact, CRMR raises their own game, including elk and bison, at a ranch south of Calgary. 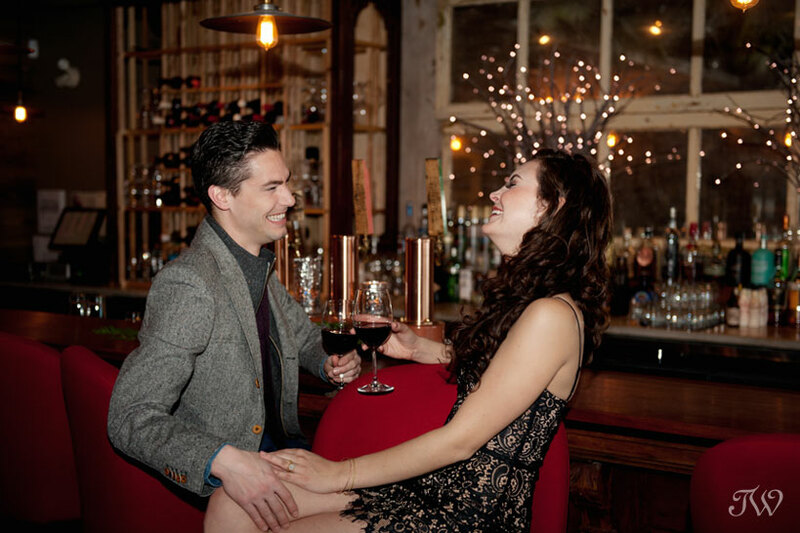 Couples can choose two entrée selections for their guests as well as a vegetarian option. 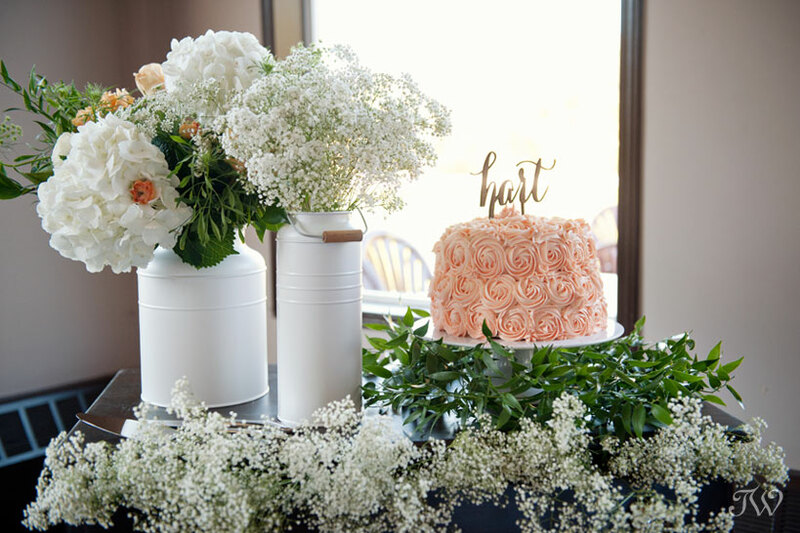 The Lake House now bakes wedding cakes in house and offers a dessert buffet filled with bite-sized treats like macarons, truffles and lemon meringue pie, to name a few. Any personal favorite items from the menu? 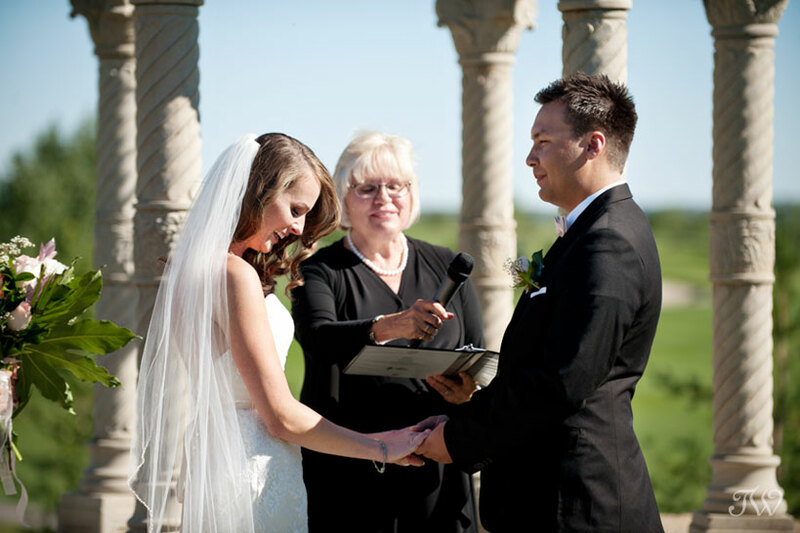 Any message you would like to pass along to couples looking for a wedding venue? 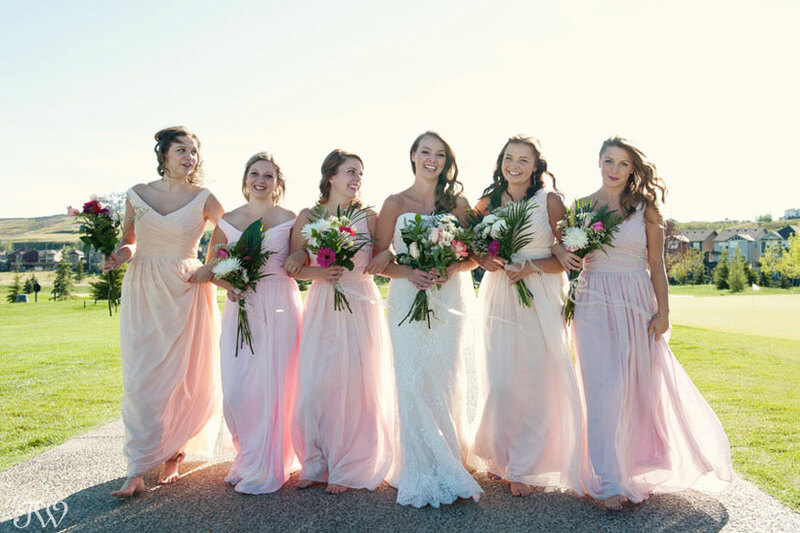 The Lake House is a full-service venue, meaning you can host a wedding ceremony, cocktail hour and reception in the space for up to 140 people. 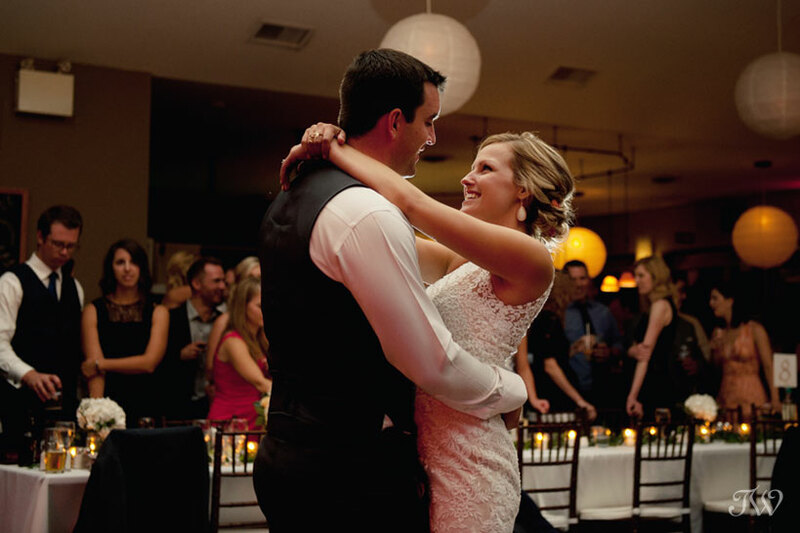 They can accommodate up to 190 people for reception-only celebrations. Rather than a charge for space rental, there’s a minimum food and beverage commitment. 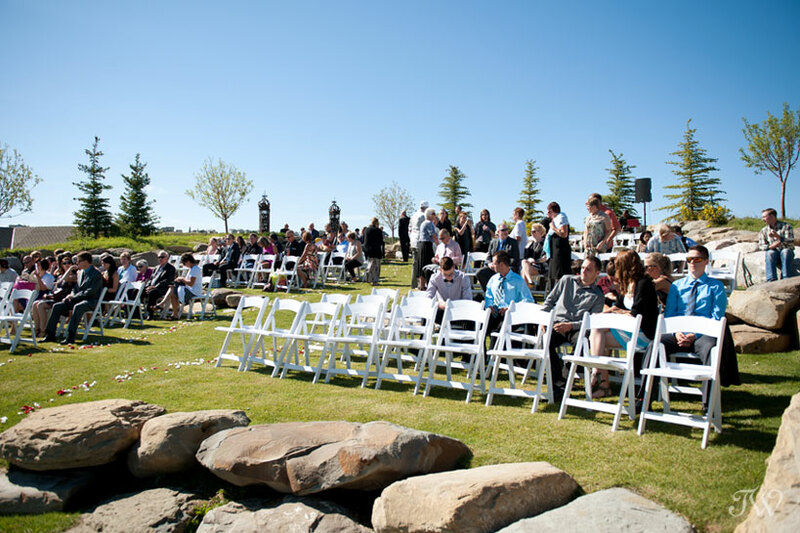 Because of the open concept, there are multiple possibilities for ceremony set-up and table arrangements. The space is also equipped with a fully-automated audio/visual system. 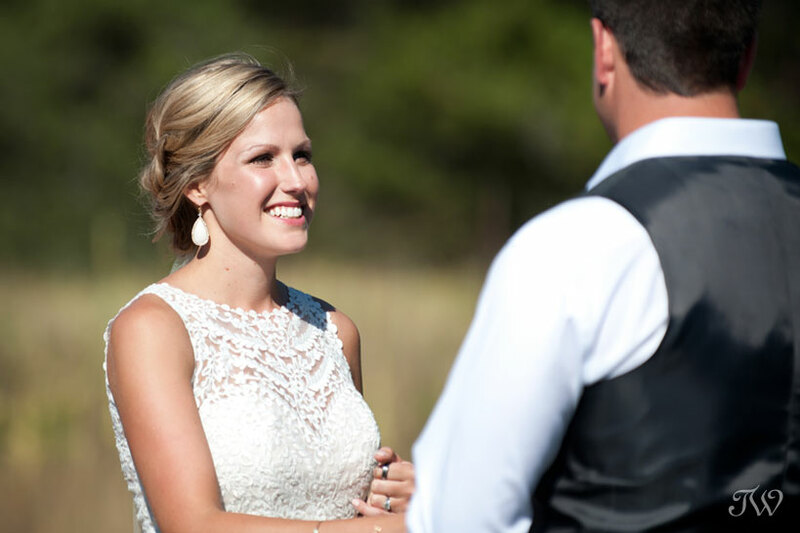 Kirsten Davies is the dedicated event coordinator at The Lake House. 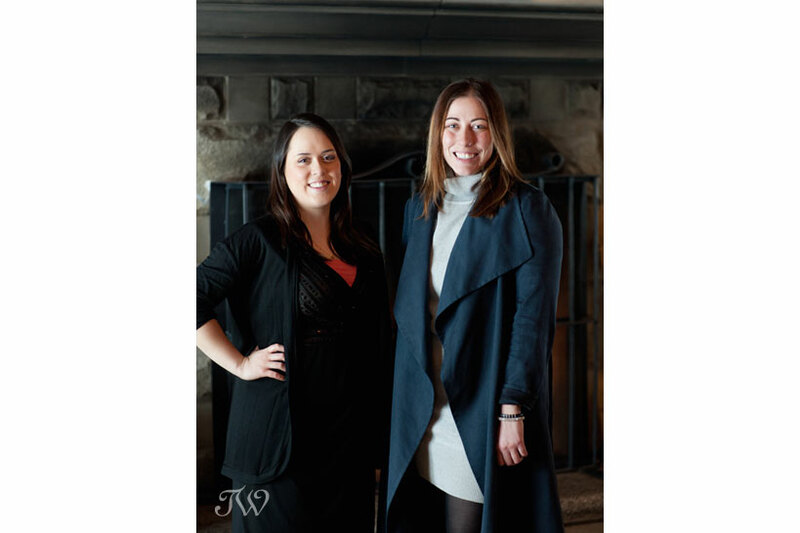 She’s knowledgeable, enthusiastic and available to guide you through the planning process. 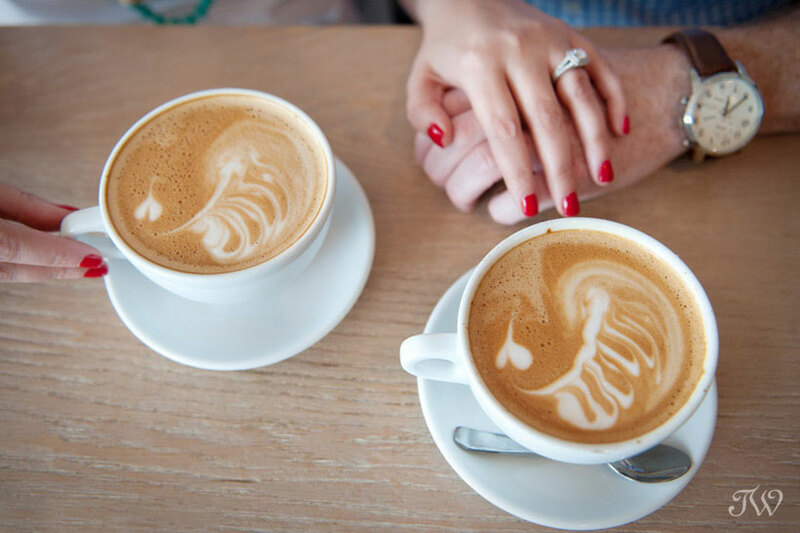 Are there any openings for couples getting married in 2016? Thank you to Pamela and Kirsten for the information and for being such gracious hosts last week. I encourage you to take a minute to visit the website for The Lake House and see what all the fuss is about. This is such an exciting time of year. 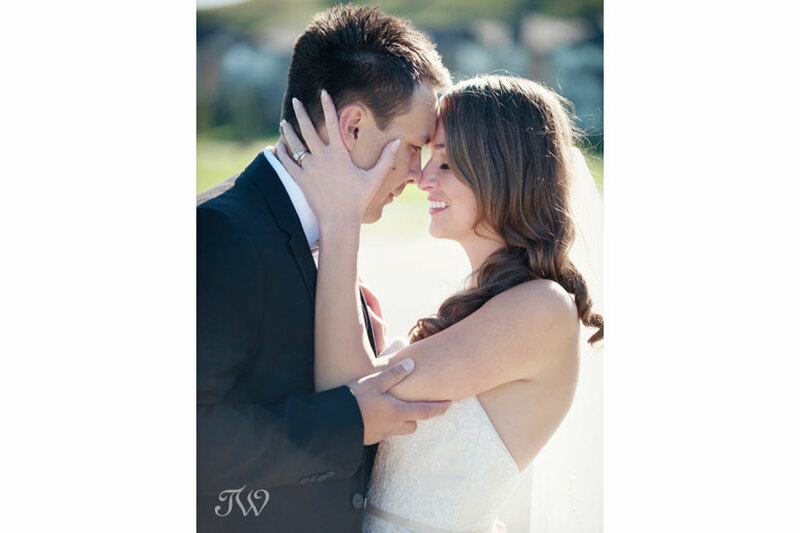 So many couples are newly engaged and are planning for their engagement and wedding photos. 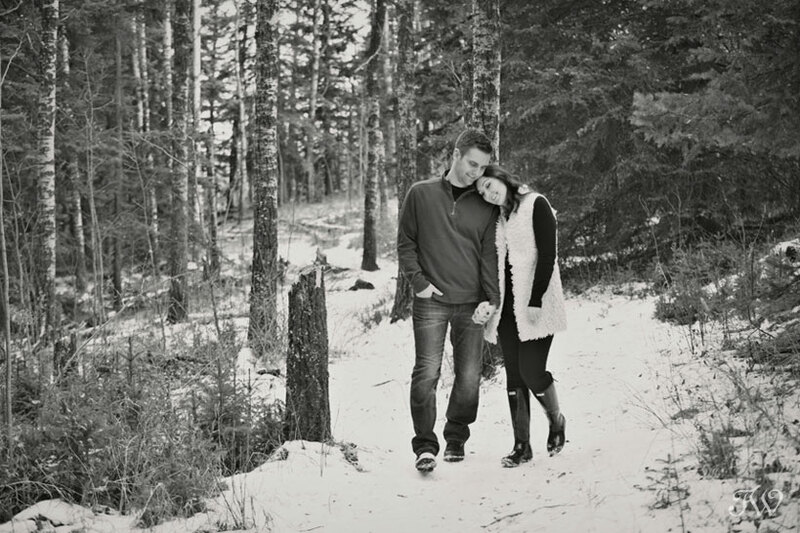 Even yesterday I was fortunate enough to meet with a couple to plan for their August wedding in Canmore. 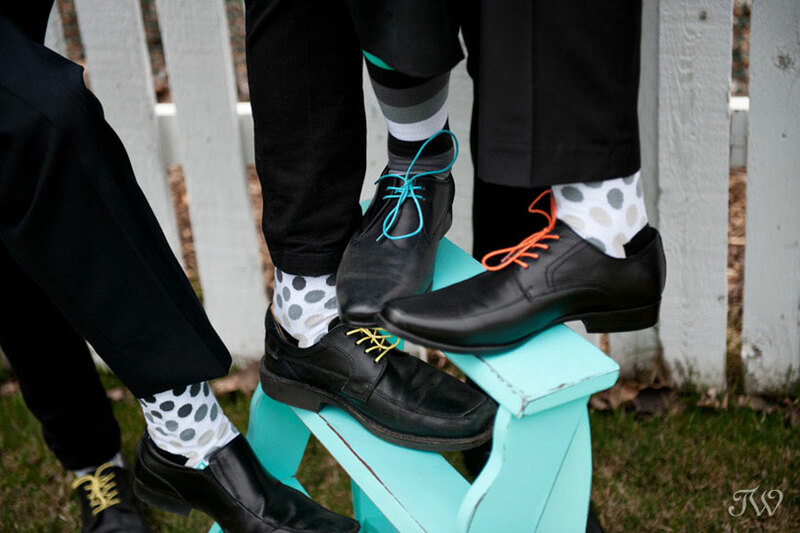 If you fall into that category and are looking for unique engagement photos, then this post is just for you. 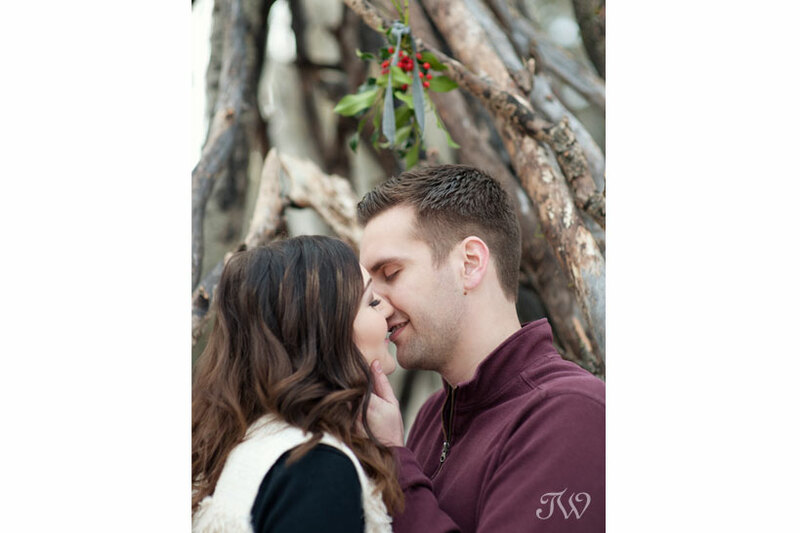 I spent a lot of time photographing people in love in 2015, during engagement sessions and couple shoots. 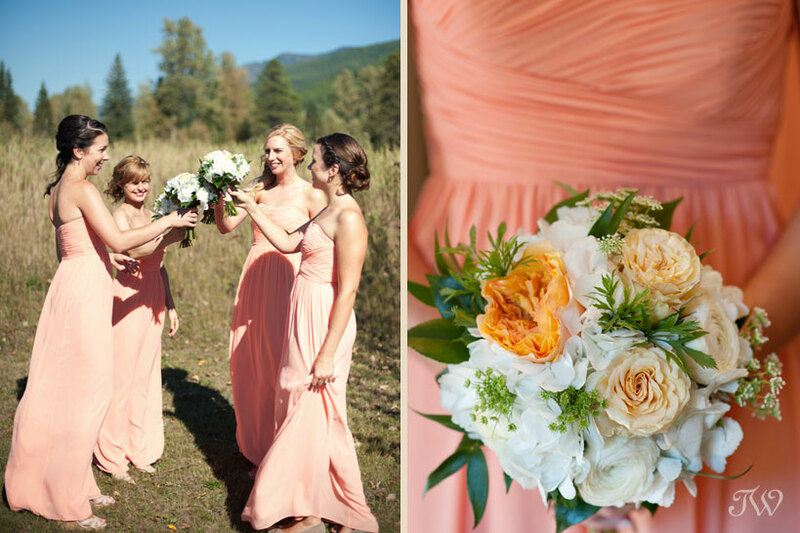 Here are a few of my favourites with a sprinkling of inspiration for every season. 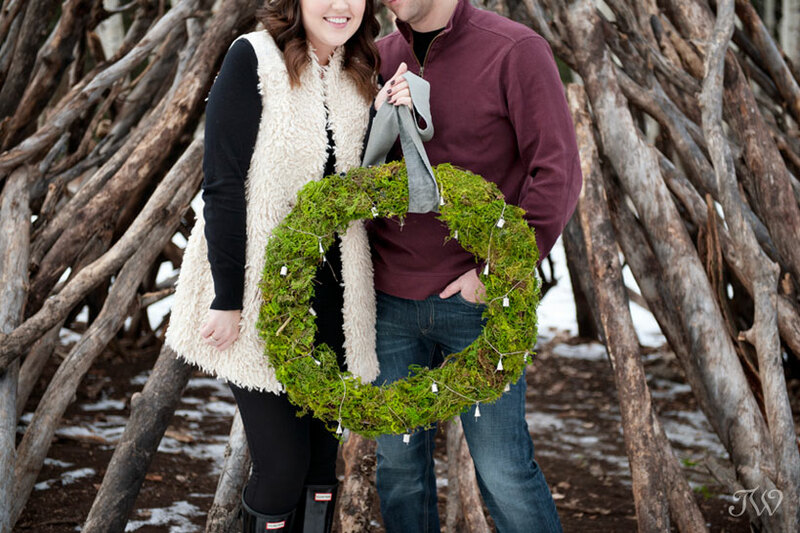 Just in time for a holiday card, I met up with Stephanie and Chris for Christmas photos, complete with a few festive touches. 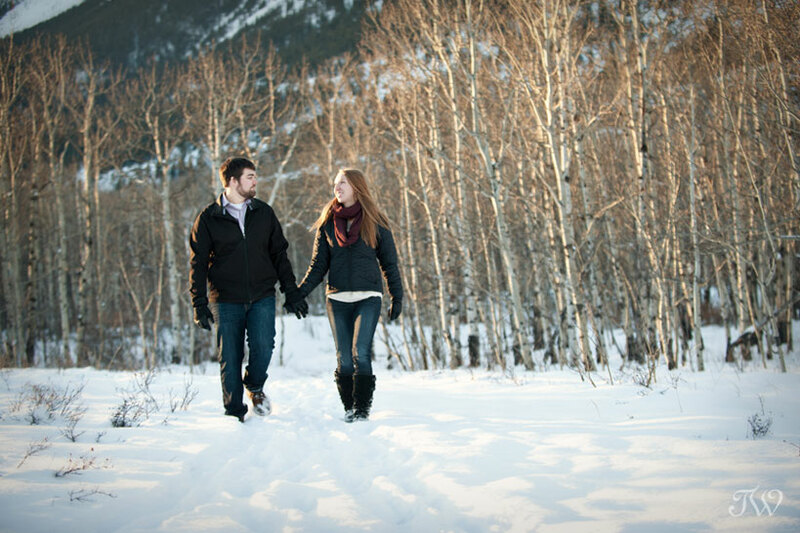 For my first engagement session of 2015, I met Megan and Kurtis near Mount Yamnuska. 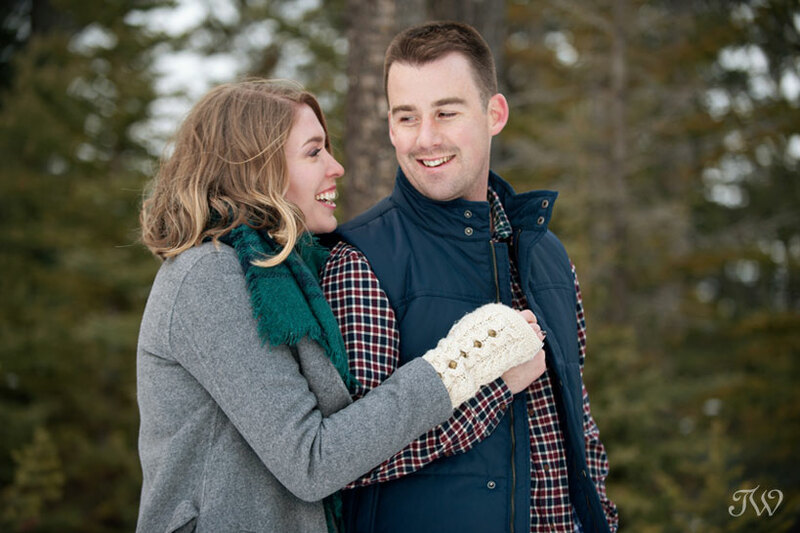 Kari and Derek celebrated a romantic Christmas in Banff for a feature on Canadian Mountain Chic. 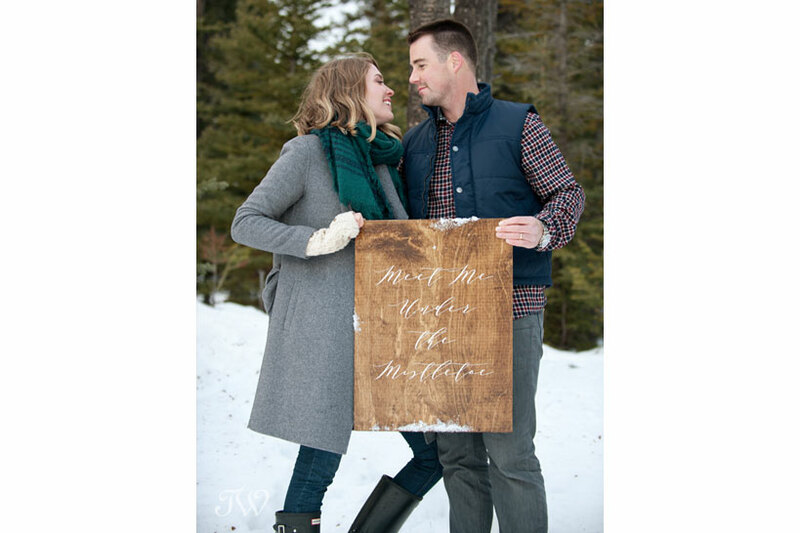 The handcrafted “meet me under the mistletoe” sign is by Naturally Chic. 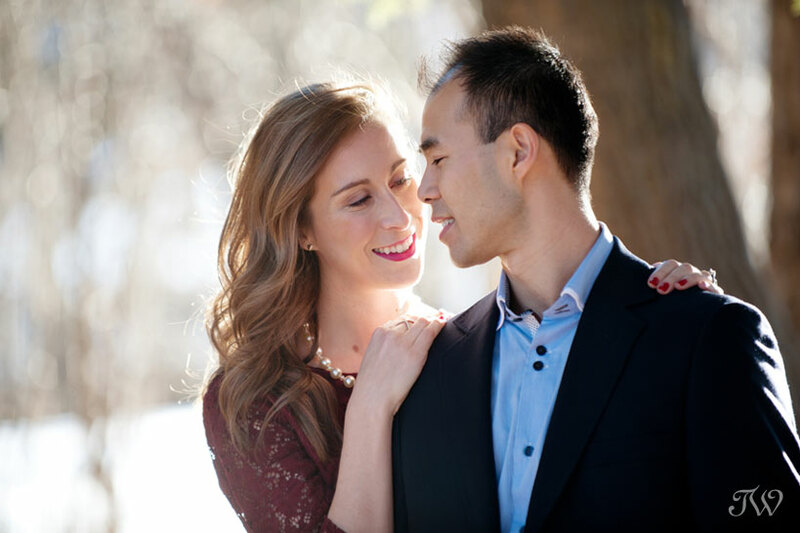 Enduring romance with Fashion Blogger Becky Kung and her husband, James. 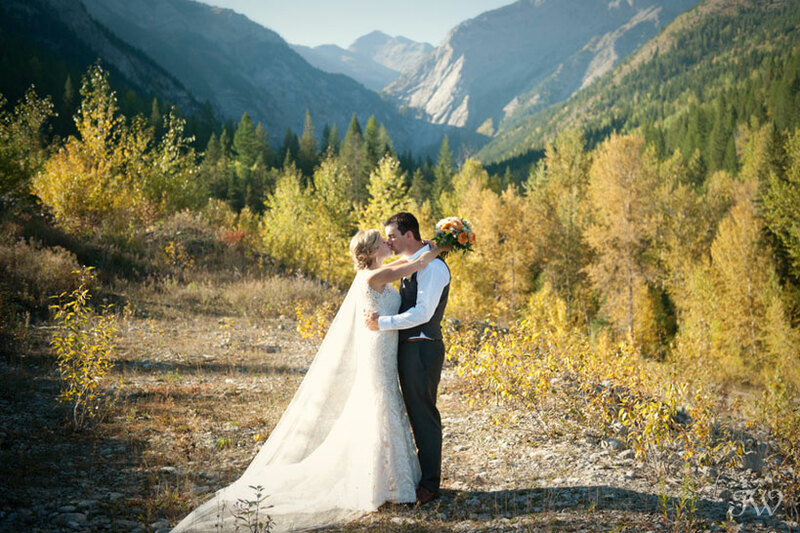 Love in the Rockies. I met Christine and Cody at Lake Agnes for a mountain hike. 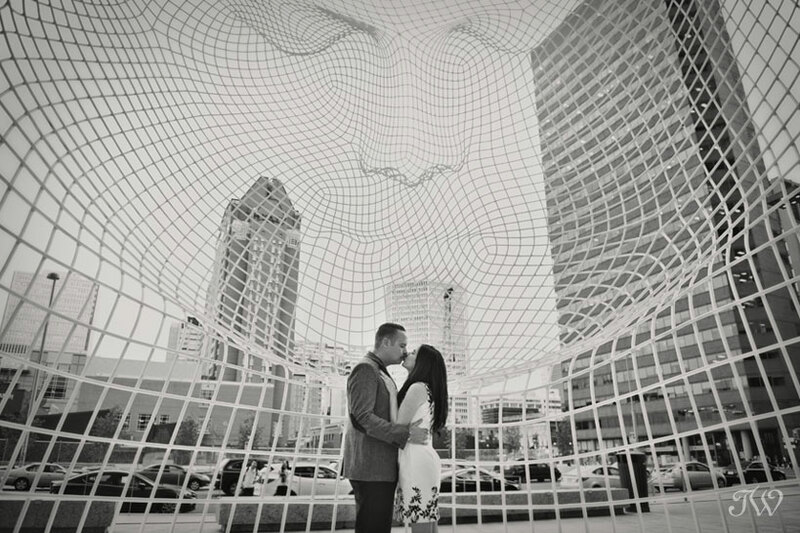 Emily and Aaron wanted a big-city feel for their Stephen Avenue engagement session. 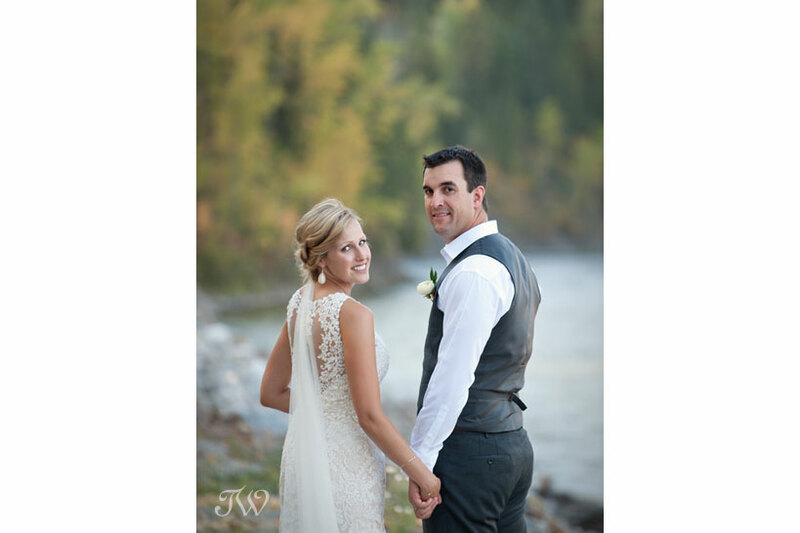 The light that night on the Elbow river was absolute perfection. 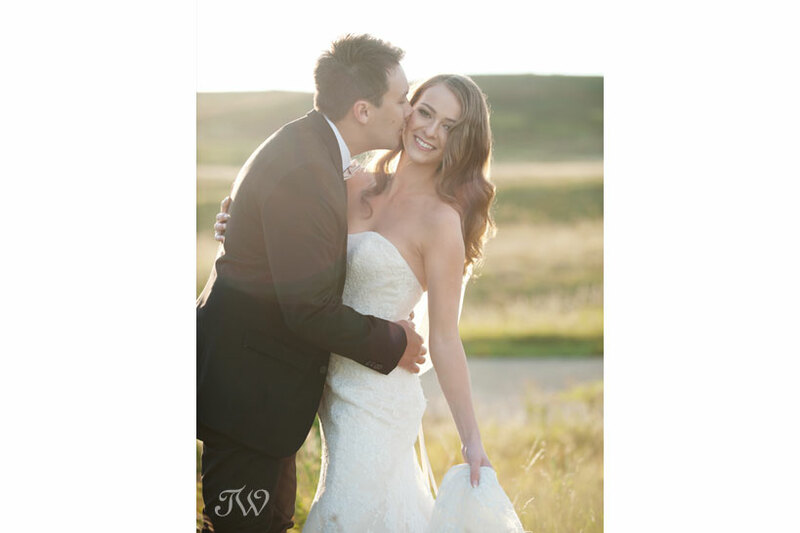 Add inner tubes and a happy couple and it really was one of my favourite shoots of 2015. 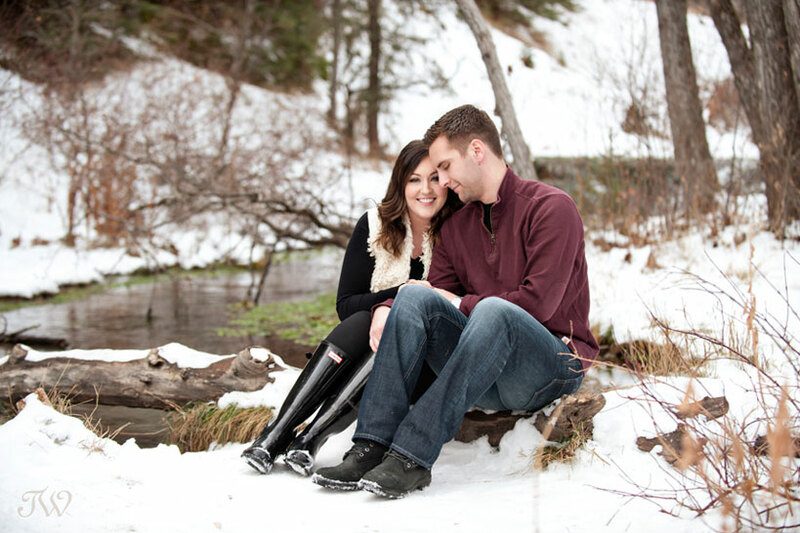 Shane and Bailey chose the perfect afternoon in Fish Creek Park for their fall engagement photos. 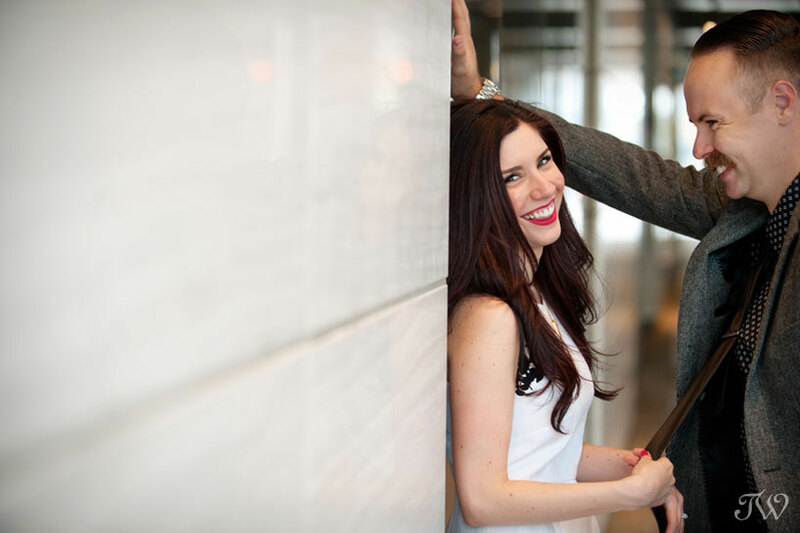 I love the challenge of creating unique engagement photos each year. 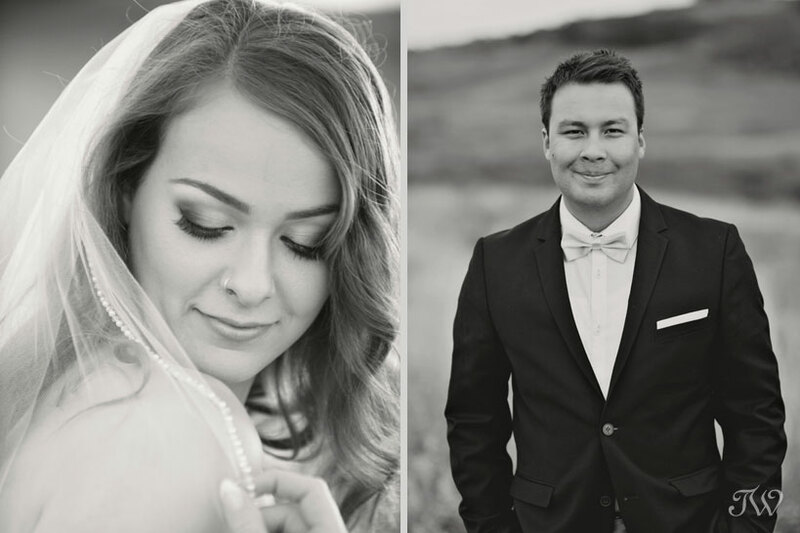 My engagement sessions begin at $750 but are also included in many of my wedding packages. 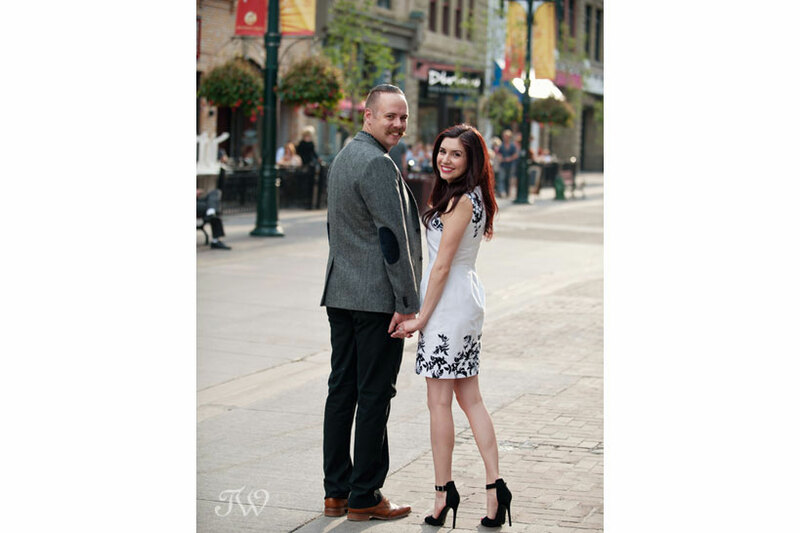 For more information, please contact the studio at photography@tarawhittaker.com or by calling 403-247-3746. I look forward to hearing from you. 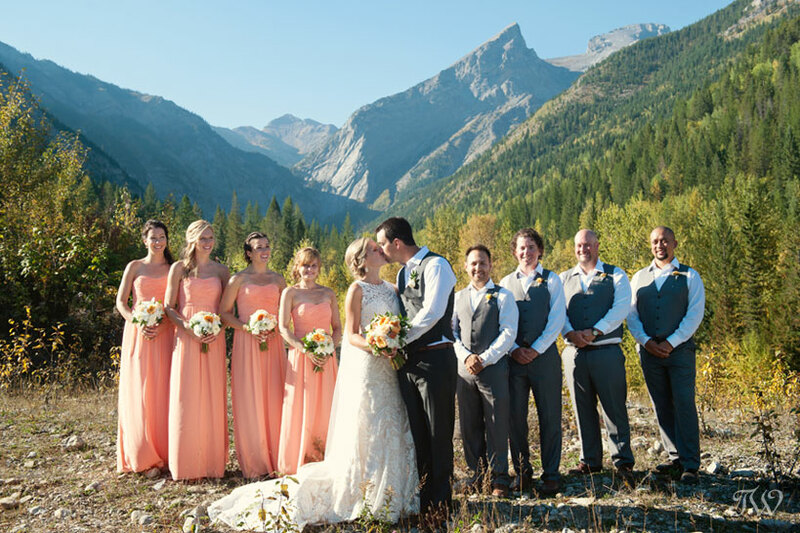 A globe-trotting couple, a stunning mountain location and a lighthearted autumn ceremony made for the perfect day. 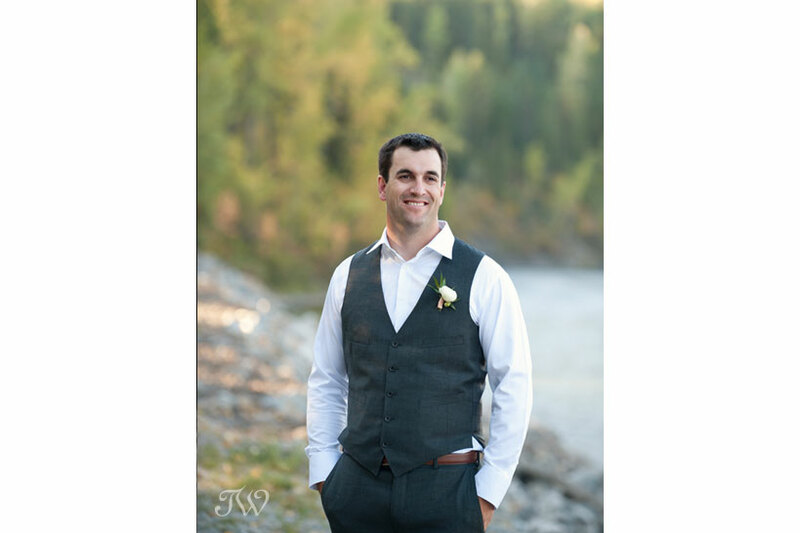 I was so thrilled when Janelle and Jody chose me as their Fernie wedding photographer and I’m delighted to share some highlights from their celebration today. 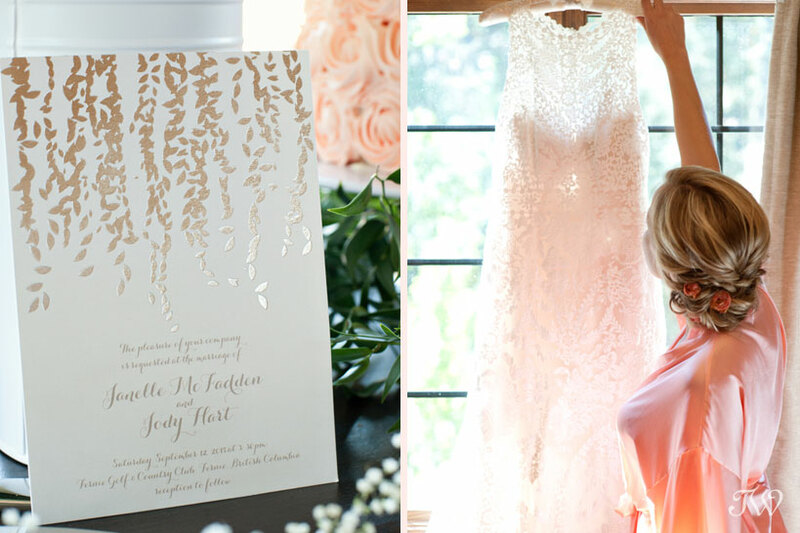 As an added bonus, Janelle is adding her thoughts and a few tips and tricks for brides. Enjoy! 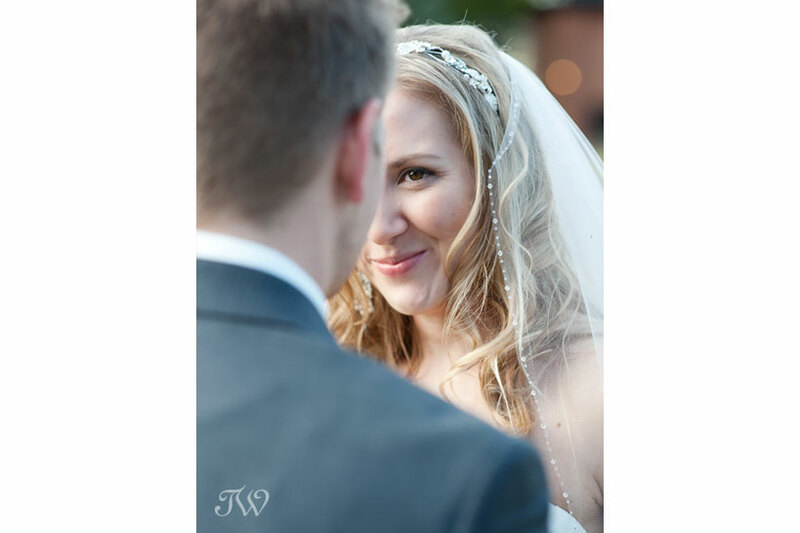 From Janelle…so many things could go wrong on your wedding day but it’s important to go with the flow and not let it affect the joy of the day. 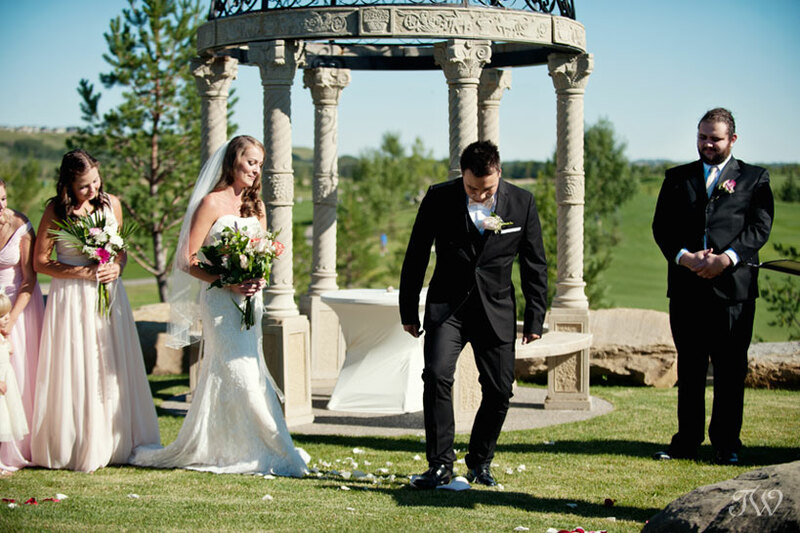 For example, the hook-and-eye on my dress broke while I was getting ready, my wedges literally fell apart while I was walking down the aisle, the arbour almost blew over onto us during our ceremony, and my veil fell out while saying my vows. With all of it we just laughed, sorted it out as best we could and look back on it as funny memories from the day. 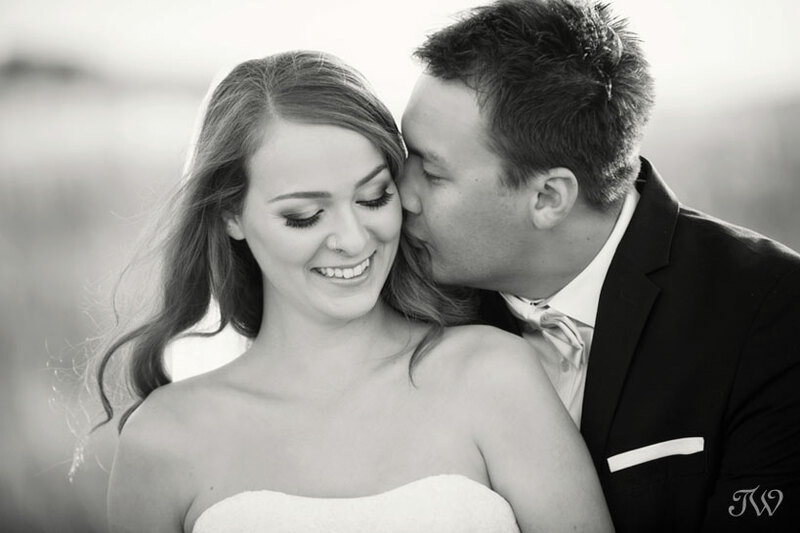 From the bride…Jody and I met on the other side of the world and continue to share a passion for travelling together 10 years later. 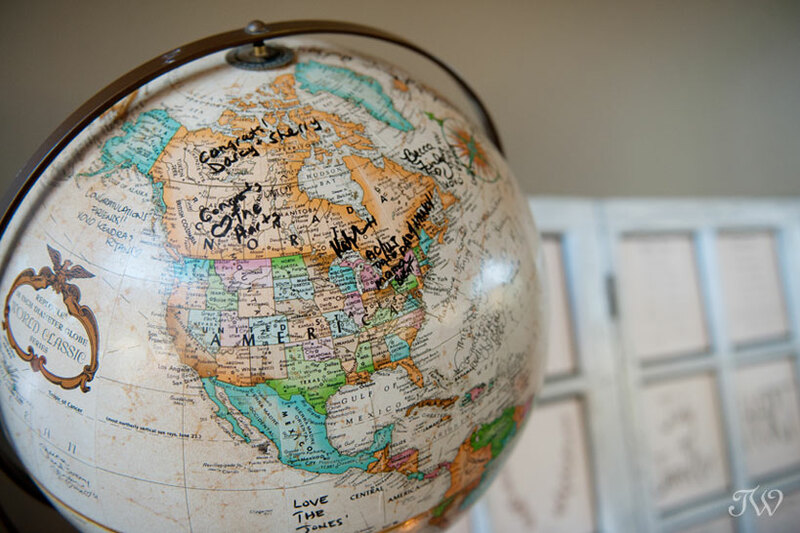 A globe seemed like a fitting choice for our “guest book” as something we would happily display in our home for years to come. 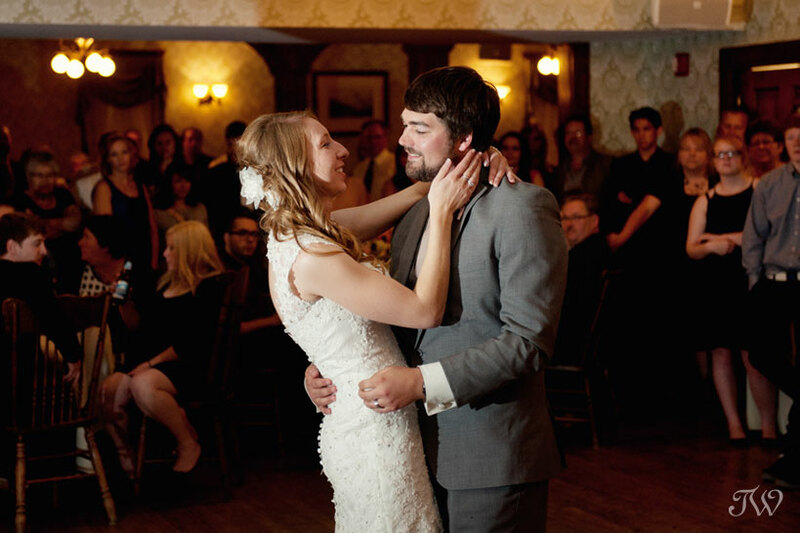 Typically when my husband and I attend weddings we don’t see much of each other throughout the evening as I love to dance and he definitely does not. So when I first heard the Lee Brice song “I Don’t Dance” it obviously struck a chord with me. 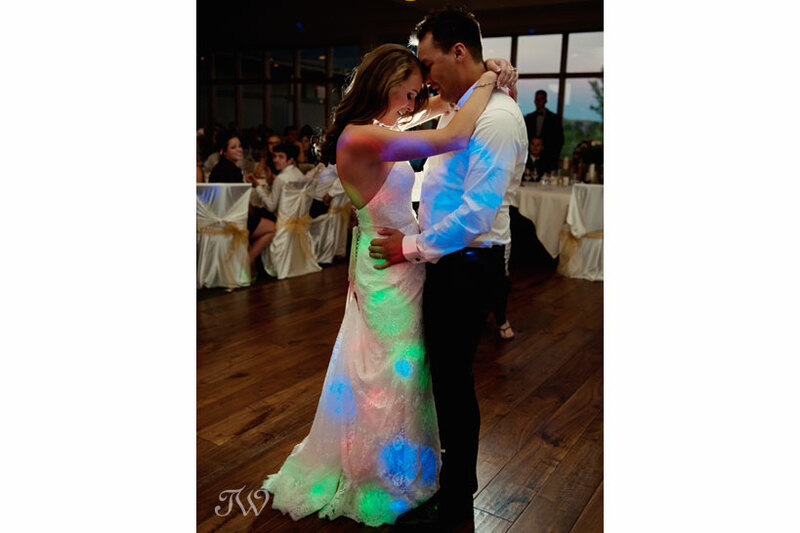 We chose this song for our first dance and I can remember the oh-so-cliche feeling of being the only two people in the room, singing to each other “I’d do anything with you anywhere… but I don’t dance”. 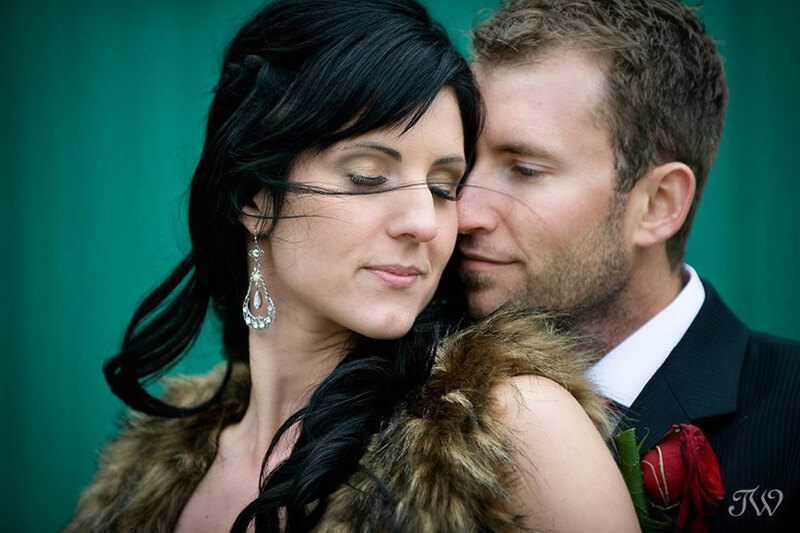 Many congratulations to Janelle and Jody and a big hand to everyone involved in this beautiful wedding. 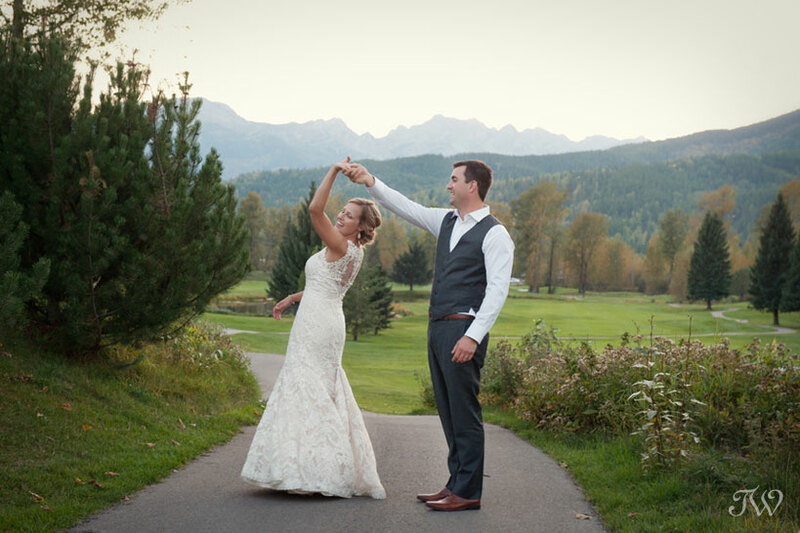 A special mention to Rachel from Mountain Bride. What a treat it was to work with you! A big thank you to my second shooters, Becky & James.